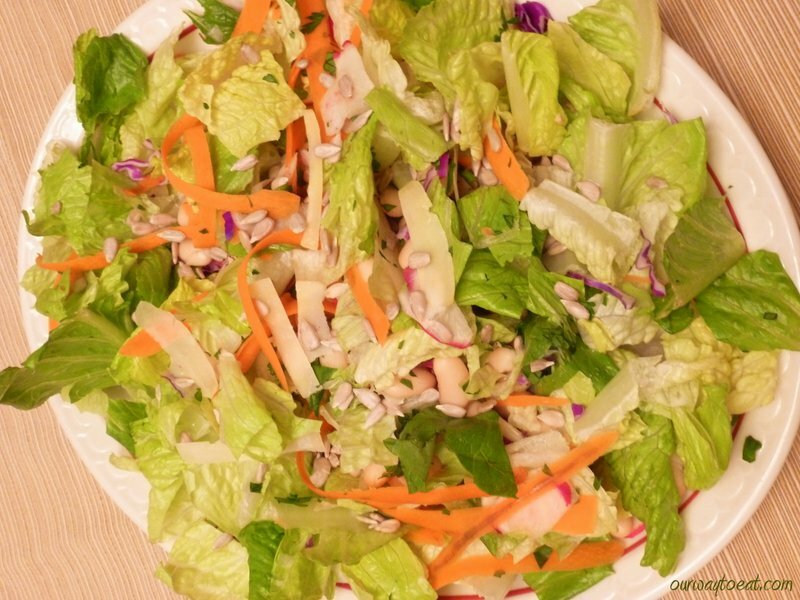 You might think a person’s natural “Salad Season” would occur in the summer. 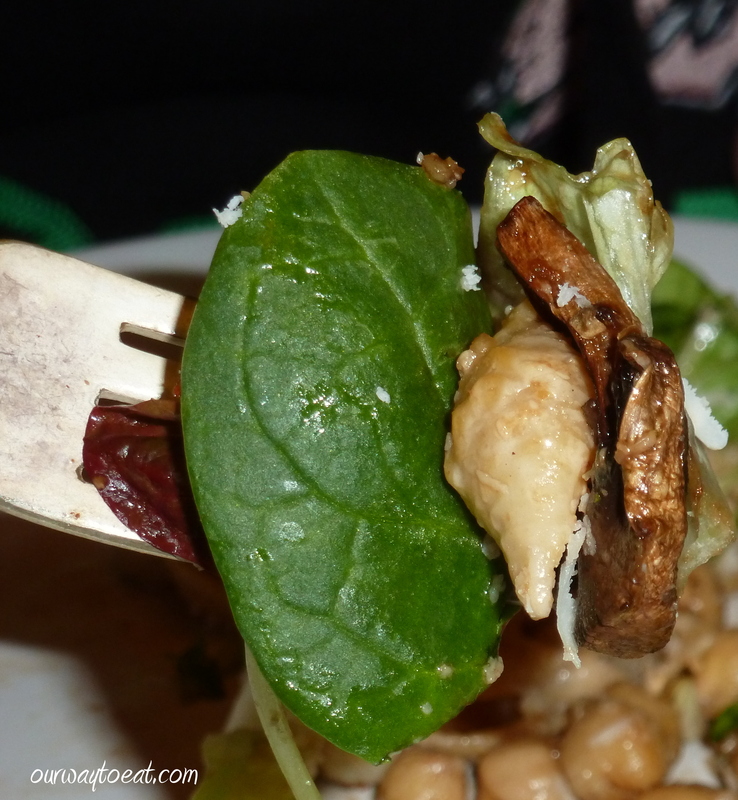 Since I started photo-documenting the food we eat, I have discovered our true salad season occurs in the deep winter. We certainly don’t have a dazzling array of garden and local produce available, but even so, we do our best to choose the best produce and canned goods available to get by. 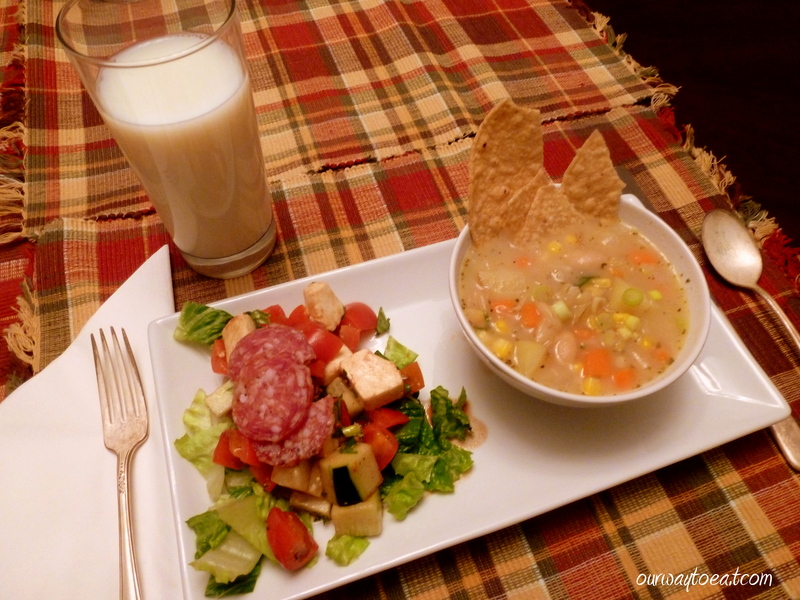 This is probably the season when we need hearty salads the most here in the Midwest. Our bodies are hiding in bundles of clothing, we spend our time mostly indoors and in natural darkness, and we inevitably encounter a number of virus threats on a weekly basis. I consider these light, bright, crunchy, energizing, nutrient rich, colorful salads, [along with sleep] to be one of the secrets to a maintaining a pretty reliable immune system. They are also my January-February hope that when spring arrives, I will feel and look more springy than a person feels in the depths of winter. Our first salad, shaved carrot, Parmesan, radish, white bean and raw sunflower seeds on romaine. I start preparing our salads by adding its prominent components to a bowl. 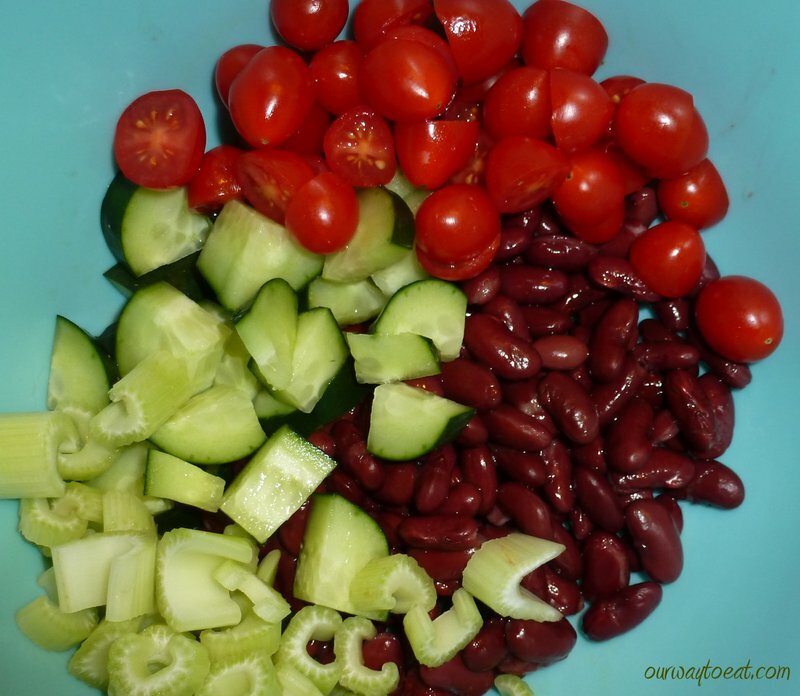 Chop something crunchy (celery), add a protein (kidney beans), add any other vegetables you have on hand and wish to include (here, cukes and halved grape tomatoes) , toss with greens, (here, romaine and spinach). If you care to, add a flavor/texture “treat” such as seeds, nuts, avocado, egg or a bit of cheese. 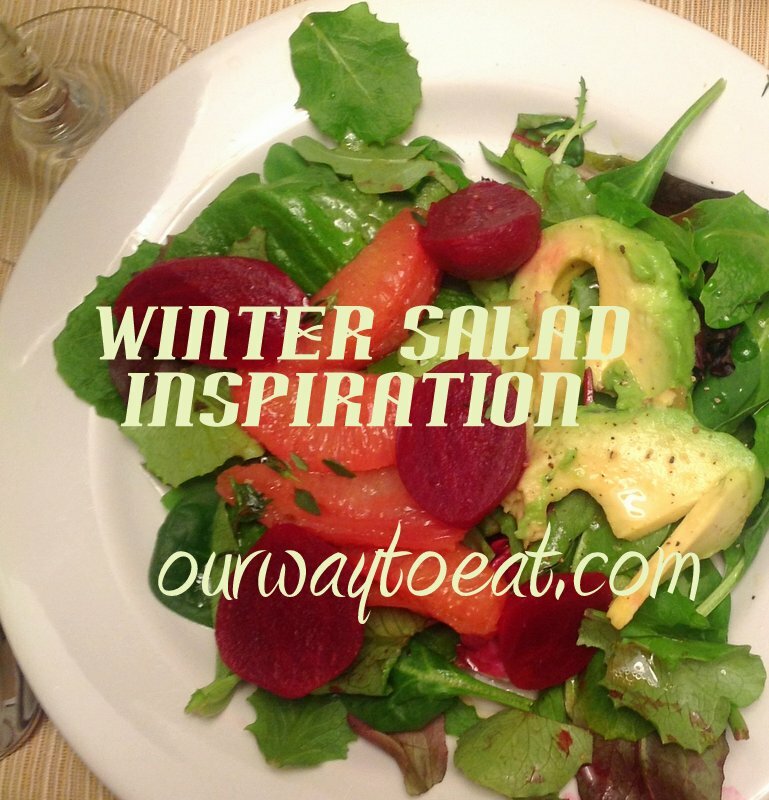 This is the way to make a great winter a great salad. I typically toss greens with either some citrus juice, lime, lemon, orange or grapefruit or a flavored vinegar. My favorite vinegars are red wine, balsamic or tarragon vinegar. Then I drizzle just a few drops of olive oil and toss the greens. It is surprising how little oil you need to bring all of the flavors together. Sometimes I add a tablespoon or two of Dijon mustard, or a teaspoon of honey or jam to the oil and vinegar/citrus mixture before mixing vigorously to add further flavor and help the dressing to emulsify before tossing the liquids with the greens. 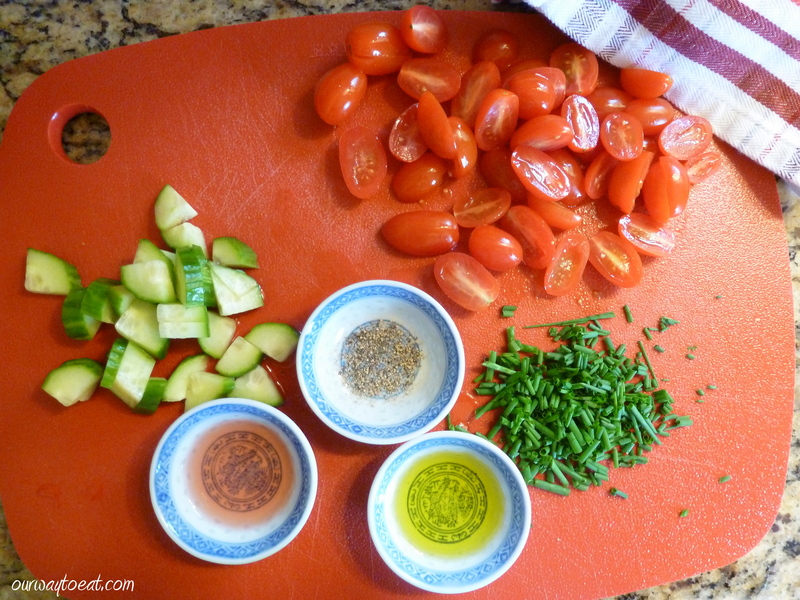 Chopped fresh herbs or dried herbs along with salt and pepper added according to taste complete the dressing. 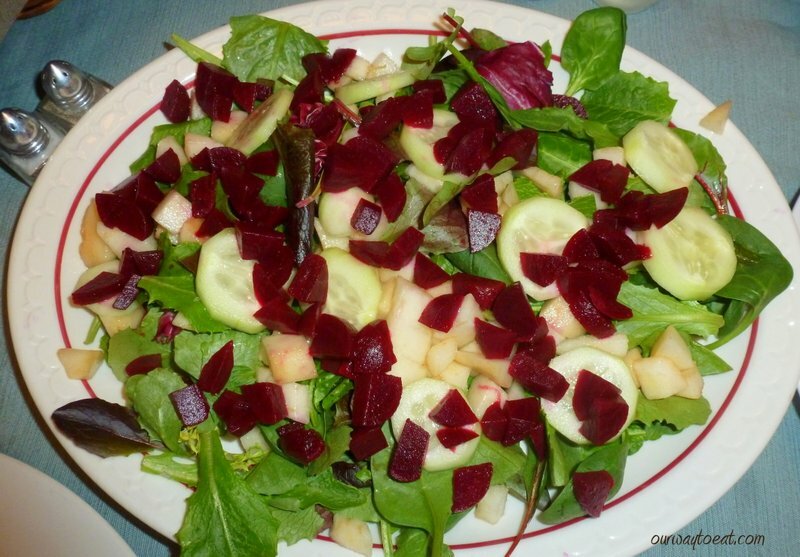 This salad is composed of beets, peeled bosc pear and sliced cucumber on mixed greens dressed with leftover grapefruit juice and fresh thyme dressing and a little pepper and salt. Don’t hesitate to open a can of beans, beets or citrus canned (hopefully BPA free) in its natural juice. 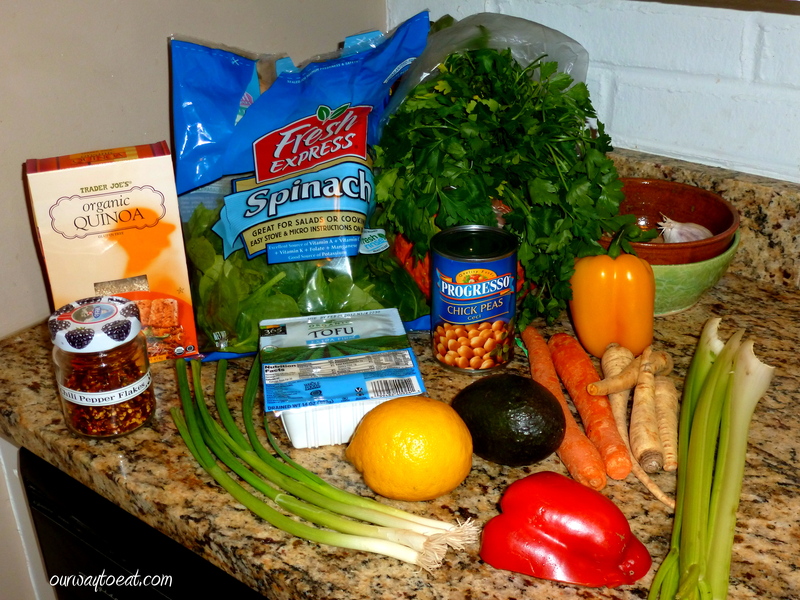 There are many health benefits and few sacrifices when you add these nutrient-rich ingredients the easy way. 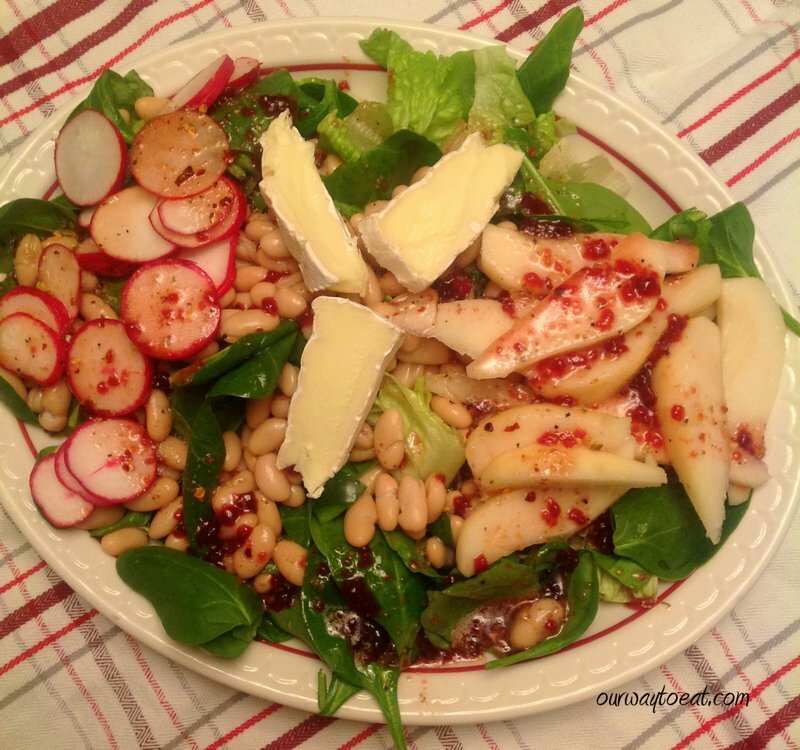 The next salad is composed of sliced radish, sliced pear, white beans and a few slices of brie on spinach with citrus-preserve dressing. Another great salad is composed of corn, black beans, peeled and quartered cukes, minced scallion, halved grape tomatoes and pepitas dressed with lime juice, olive oil, honey and chili flakes over romaine. 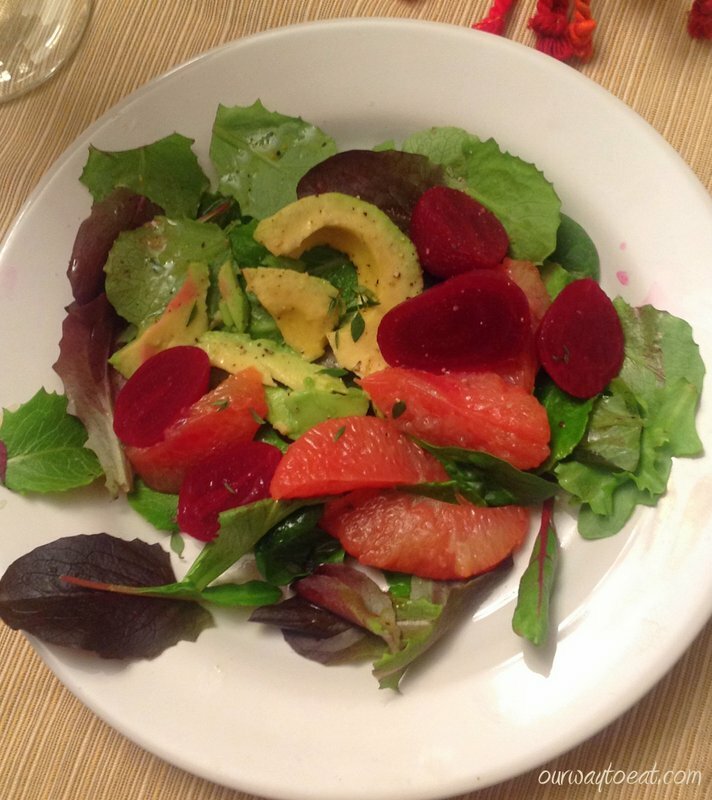 In my book, this winter salad is special, grapefruit supremes, sliced avocado and red beets on mixed greens with grapefruit juice and olive oil dressing with thyme leaves. 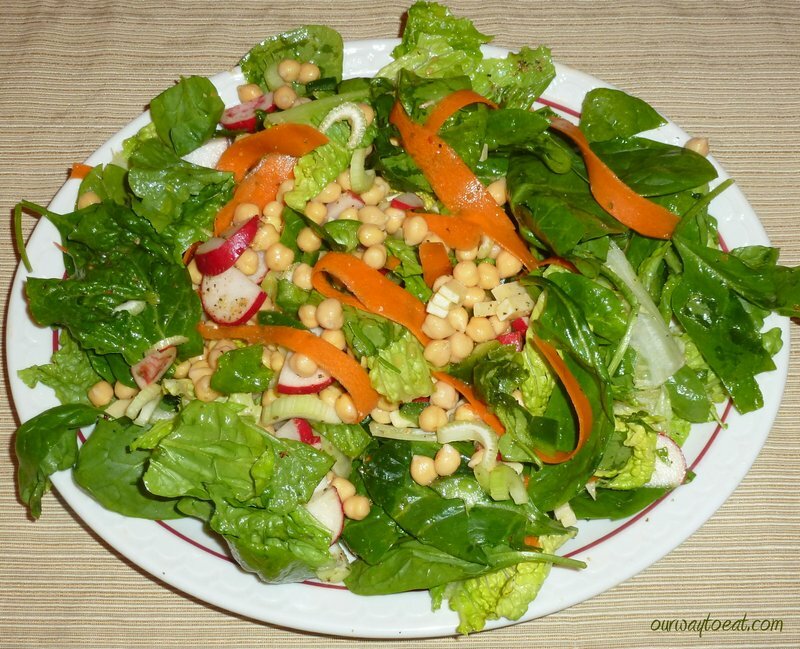 Here is another hearty and satisfying salad we’ve enjoyed composed of shaved carrot, celery, chickpeas, sliced radish and provolone on romaine-spinach mix. Salads in winter are limited by the produce in season, but those limitations can open up room for creativity. 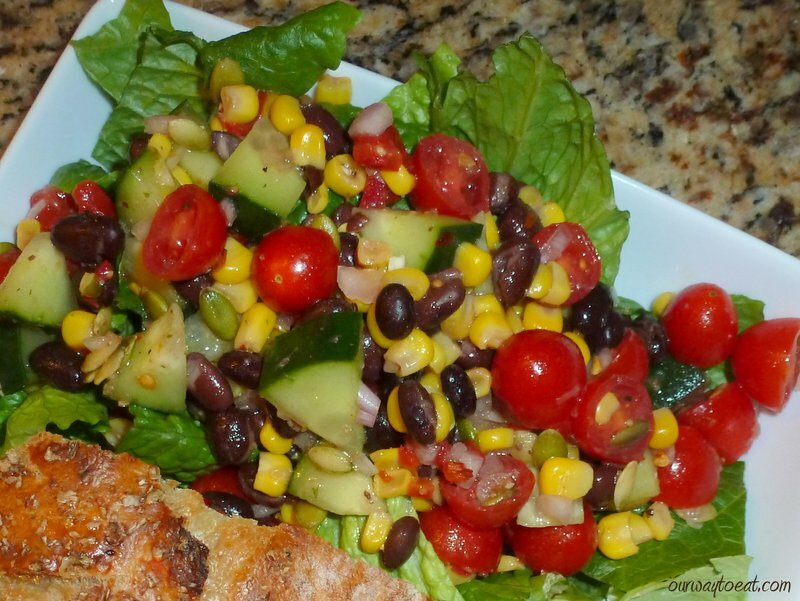 Salads like these complete a meal as a healthy side dish or stand as a meal on their own. Certainly, they brighten your plate and the winter— try ’em. This is one of my favorite moments in the spring. 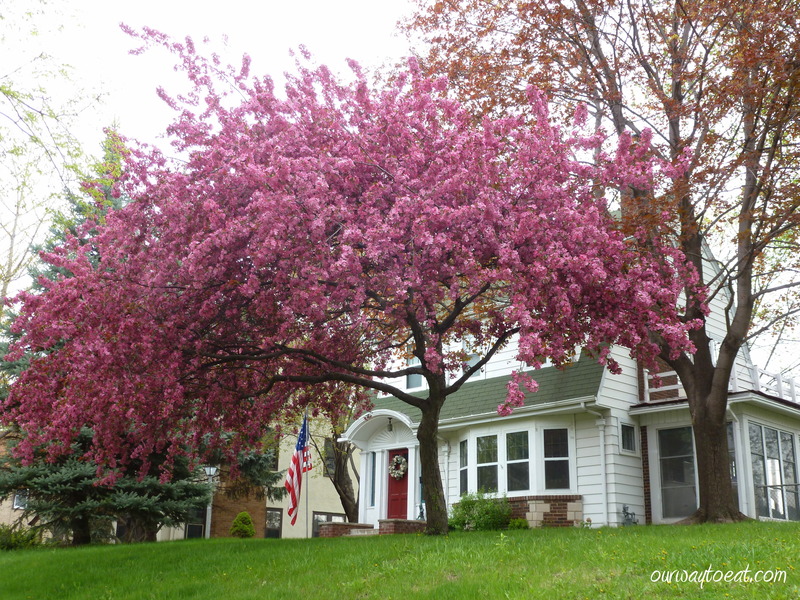 We have a tree in our front yard that has burst into bloom and covers our yard in an a canopy of electric-pink blossoms. When the wind blows, soft petals drift through the air and settle into the grass like fuchsia confetti. I try not to stray far from home while this tree is in bloom, lest I miss a precious moment of our tree’s bold and reverent announcement of spring’s arrival. In the back yard there isn’t a whole lot going on yet. Most of our 96 square feet of raised beds are looking forlorn and neglected. Even so, dandelions are anxiously popping up in the lawn and there are a few random leaves of lettuce and herbs that managed to re-seed themselves poking their way up in our raised beds. 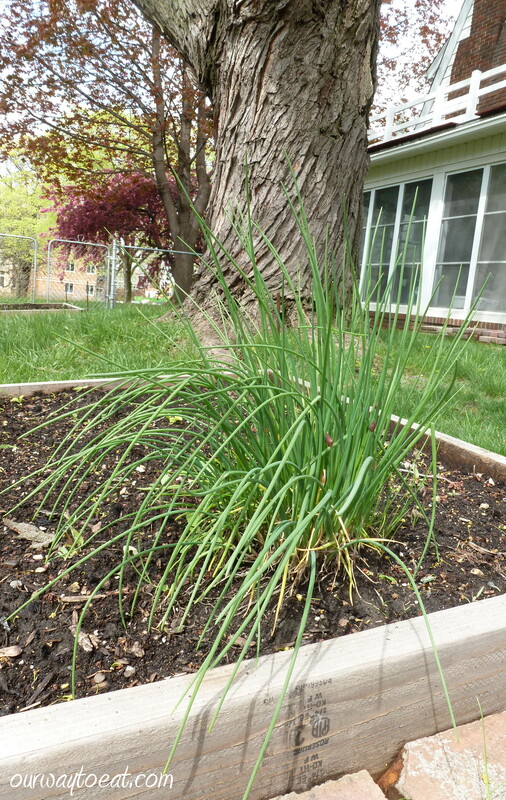 The exceptions are the 2 square feet which are abundantly producing our earliest perennial crop — Chives! I swear that the first moment the sun comes out in the spring, these little troopers start growing like mad. They don’t give a rip about snow and frost. I love these dark coloured, mild-flavoured little toughies. I transplanted mine from my parents’ garden. My Mom and Dad tend an amazing flower garden in their partially wooded, partially sun-soaked yard on a lake in rural Northern Minnesota. They focus on flora and their only edibles are chives, rhubarb and my Dad’s small blueberry patch. They have always grown chives and my Mom sends me out to snip a small bunch to garnish baked potatoes and other dishes when I’m home. I love chives on potatoes, salads, and pasta and pretty much anything that can be heightened by the addition of a dark green garnish with a mild, onion-y flavour. Our garden’s earliest offering provided me with the jumping-off point for our breakfast. I did a quick Google search to see what others have been saying about chives at breakfast time. 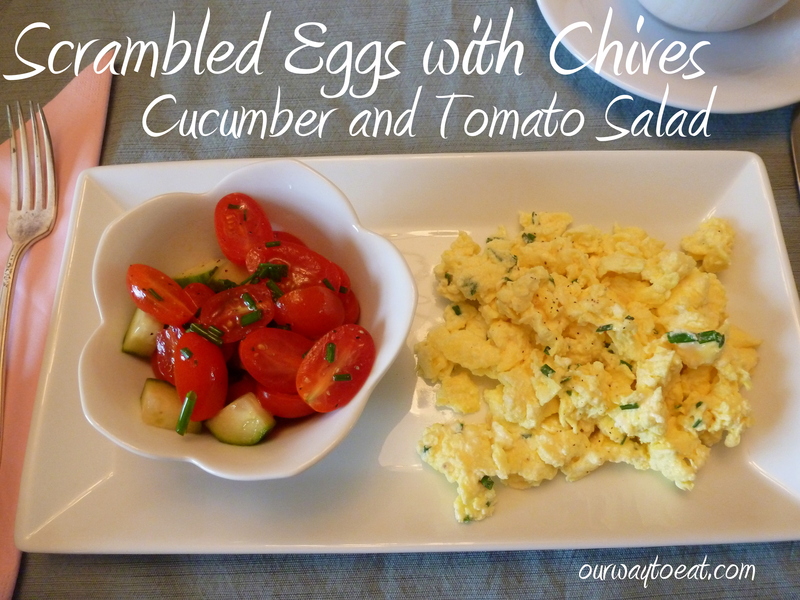 I quickly found two breakfasts with chives in a starring role. The first was a recipe for Chive Scrambled Eggs by Martha Stewart. 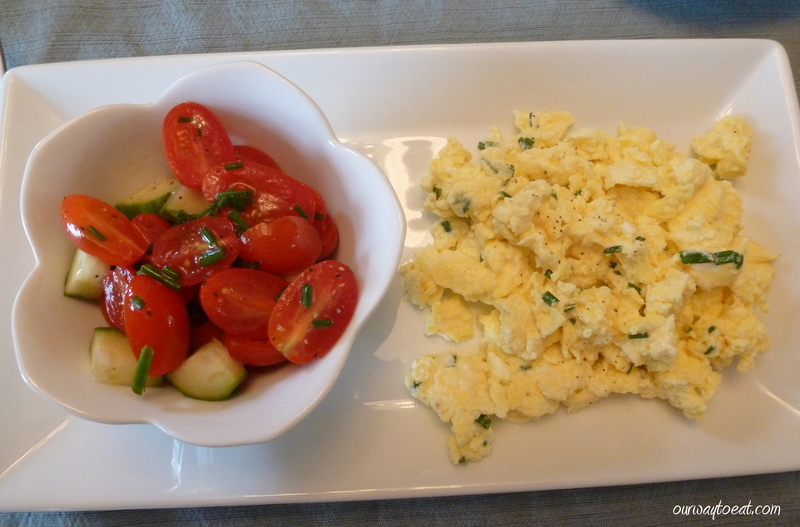 I don’t dig the thought of cottage cheese in scrambled eggs* so instead, I decided to follow inspiration and guidance in a recent post on a lovin’ forkful for our breakfast of scrambled eggs with chives and a grape tomato salad with a few tweaks of my own. To begin, I went outside with my kitchen scissors and snipped a small bunch of chives from each of my two abundant bunches. There will be no shortage of chives for us this summer, but I still try to use each bunch equally. Then I sliced about a cup of grape tomatoes in half the long way, and sliced a chunk of English cucumber into quarters and chopped it. I rinsed, dried and chopped the chives, and streamed a few tablespoons of Red Wine Vinegar and Olive Oil to dress the salad. I tossed the cucumber, grape tomato, red wine vinegar together in a bowl with the chopped chives and fresh ground black pepper and let it sit while I made the eggs. 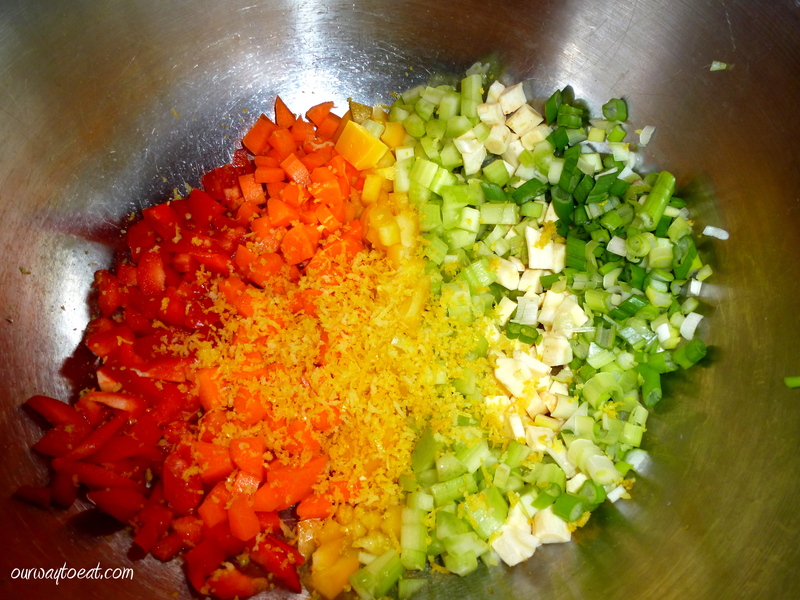 The time allows the chives, pepper, vinegar and oil to meld with the vegetables. Once the salad was assembled, I cracked the eggs 2 whole eggs into a bowl, then separated 4 more eggs, and added only the whites. 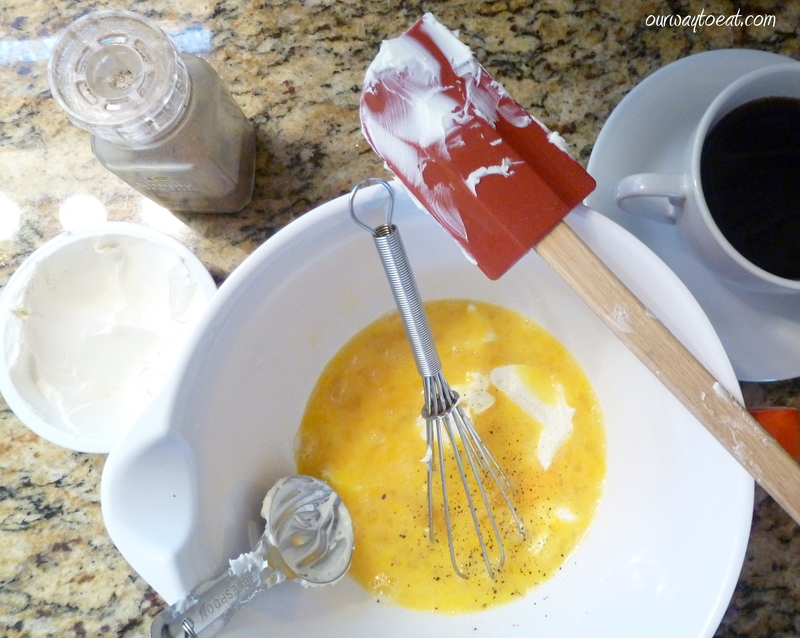 I measured the cream cheese into the bowl, and ground black pepper into the eggs. Most recipes call for salt at this point but if you add salt as much as recipes and food shows call for, you are going to consume way too much salt. There is no need to exceed healthy sodium levels in your diet. There are so many other flavors and textures going on in most meals that you don’t need to salt your food at every turn for it to taste wonderful. Once the eggs were adequately whisked, I melted the butter in a non-stick pan and scrambled the eggs. 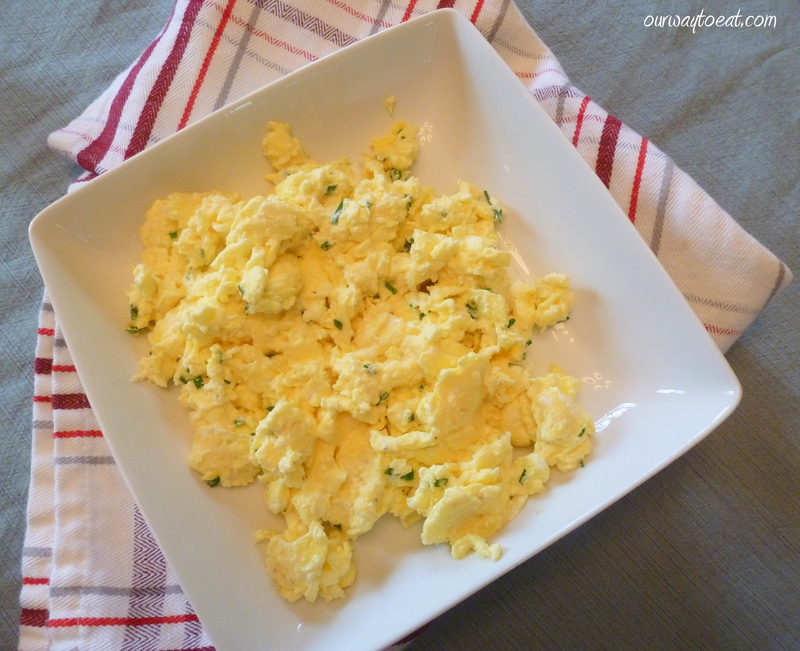 When the eggs were just set, I sprinkled chives and folded them in while the eggs finished cooking. I like my eggs on the done side. I’m all for super-soft eggs that are made so creamy and decadent at the Birchwood Cafe, but if I’m not there I prefer mine to be fairly firm. With the addition of cream cheese, the eggs stayed moist and turned out to be some of the fluffiest eggs I have ever made. As soon as the eggs were done to my liking, I served them in a low dish, and served the salad in small bowls on the side of our plates. This breakfast hit the spot. It felt as springy as the day. The salad had light, refreshing flavors and the eggs were fluffy with a subtle creaminess. 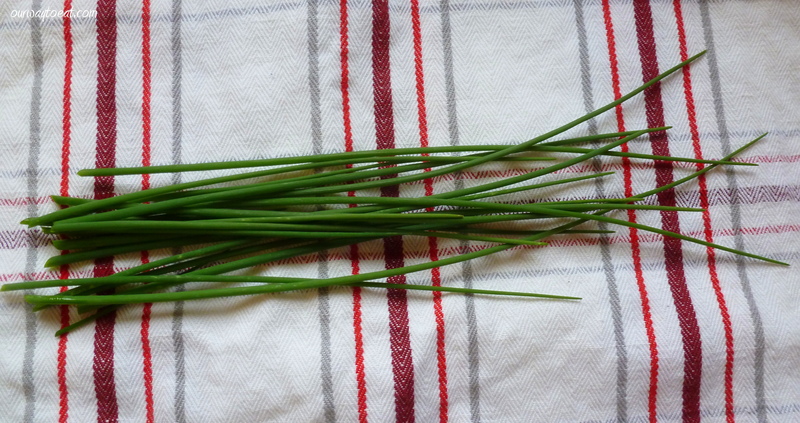 Our garden’s verdant chives carried a mild and pleasant onion-note throughout the plate. This breakfast was satisfying and gave us lightness and energy to enjoy the beautiful spring day before us, missing not one precious, perfumed breath. *I didn’t have any cottage cheese with which to try Martha Stewart’s recipe anyway. A cacophony in the kitchen that sung in harmony on the plate. Sometimes I come up with odd combinations of foods for us to eat for supper. Tonight was one of those nights. I came home with the idea of making macaroni and cheese. I didn’t want to eat a huge portion, but I didn’t want to go hungry with a tiny plate of pasta. We happen to have a fridge full of veggies and I wanted a salad that was satisfying enough to be a meal. I also wanted roasted veggies. These ideas danced in my head for awhile, and an idea emerged — I will make a salad, Mac & Cheese and roasted veggies and put them into the salad rather than serving the three separate things side-by-side. 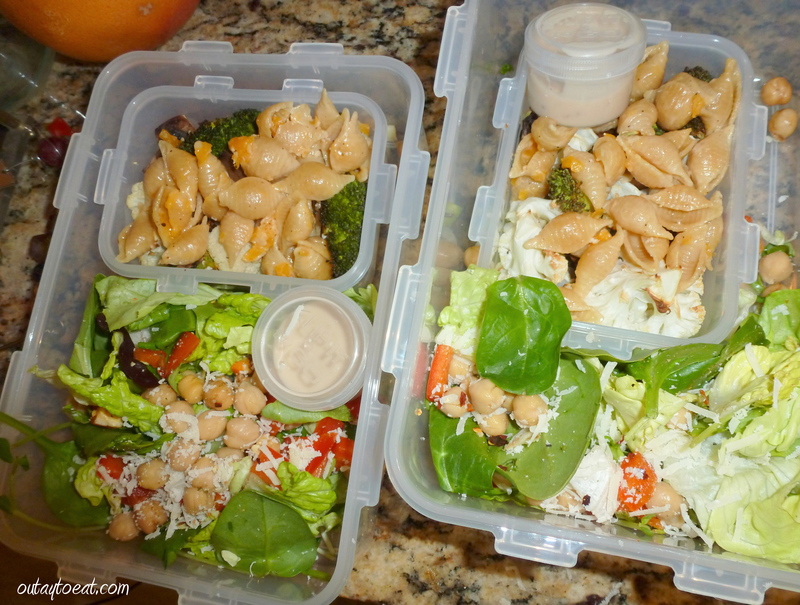 Obviously, pasta tossed into a salad is nothing new, I make this constantly in the summer for our back yard BBQ’s. 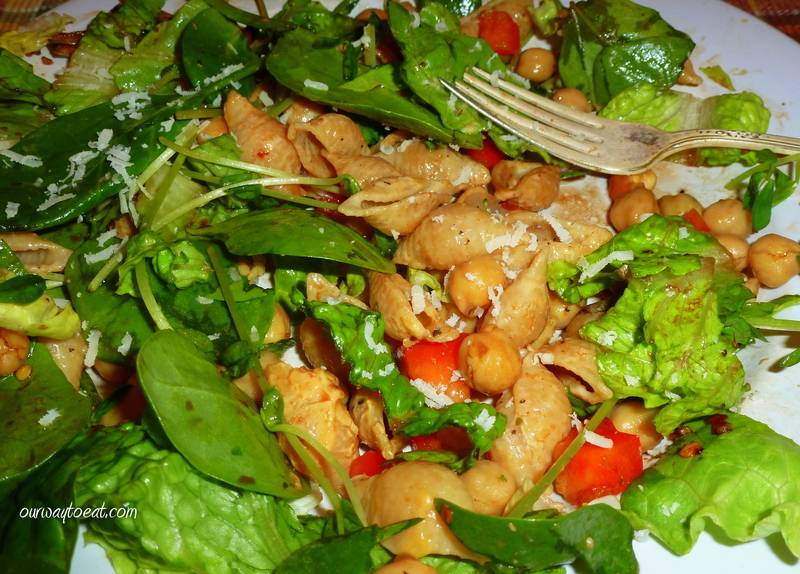 I recently read a blog post about a tasty salad combination of Penne, Chickpeas, Sun-dried Tomatoes and baby Arugula on Skinnytaste which looks pretty good. I know I’ve heard mention of hot and cold salads. When Bjorn gave me a thumbs up to having a sort-of salad for supper, away I went. I started by breaking off florets of broccoli and cauliflower to roast for the “hot” part of the salad. I tried to picture the amount I would want for 4 servings of salad so that I didn’t make too much. My goal is to prepare enough to feed us twice. Two plates at supper and then leftovers for lunch. I dumped the broccoli and cauliflower, along with some sliced button mushrooms on a sheet pan coated with cooking spray, and threw it in the oven, which was heated to 425 degree Fahrenheit. I didn’t add any oil to the veggies. A drizzle of olive oil tastes great on roasted veggies, but I was planning to dress the salad before serving, so I didn’t use any. It really isn’t necessary. When you roast veggies without oil, they tend to char a little more than when they are tossed lightly in oil. That char is tasty. While the veggies roasted, I put a small saucepan of water on the stove to heat, and salted it lightly. 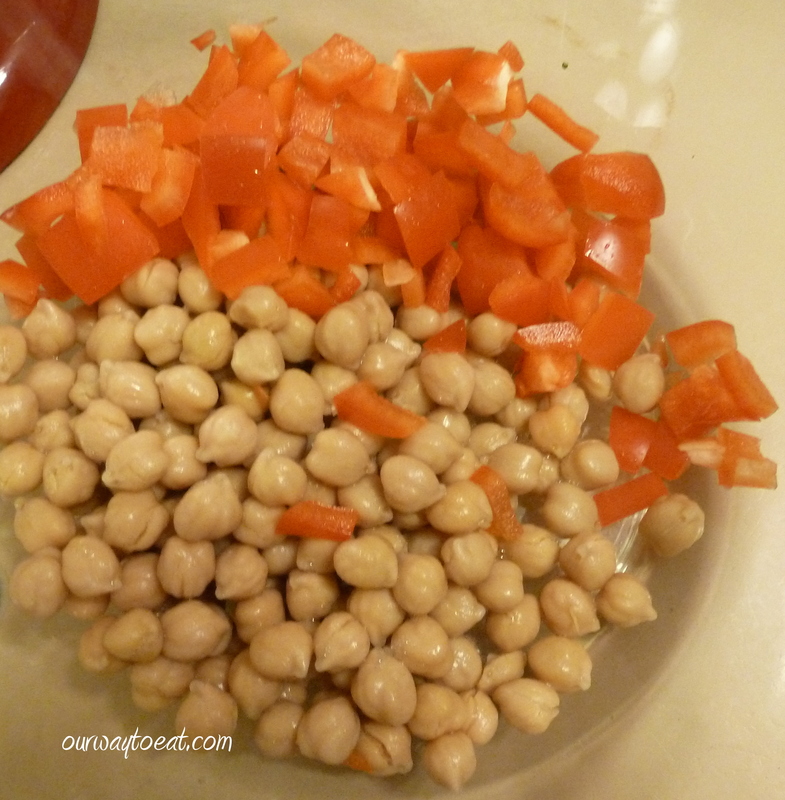 While that heated, I chopped a half of a red pepper into chickpea-sized chunks, and rinsed and drained a can of chickpeas. I assembled an assortment of greens. We had a great variety in the fridge. 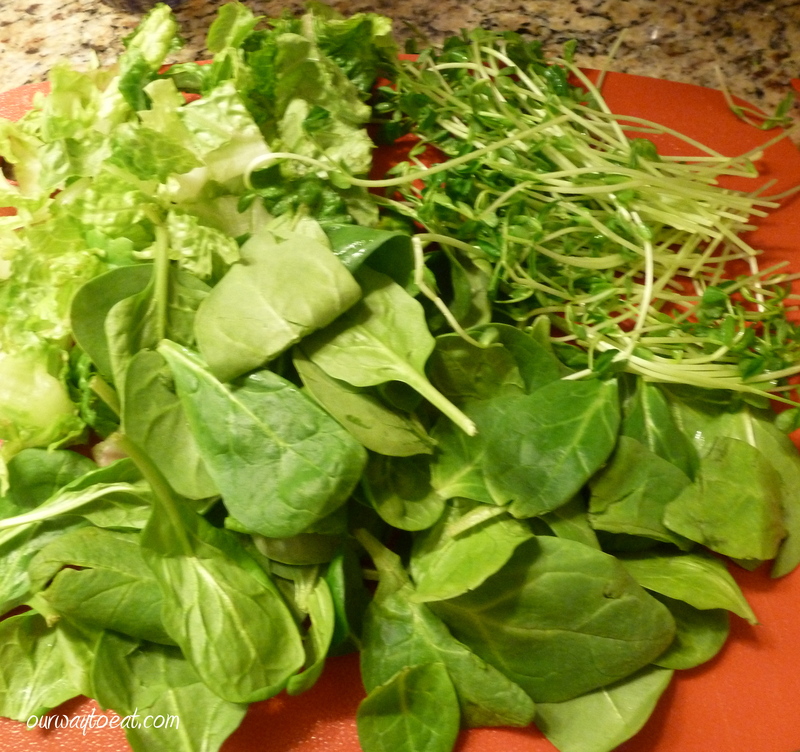 Our salad tonight had baby spinach, Butter and Romaine Lettuce and Pea Shoots. When the Broccoli, Cauliflower and Mushrooms had roasted for about 8 minutes I used tongs to toss it around so that all sides would get exposed to heat. 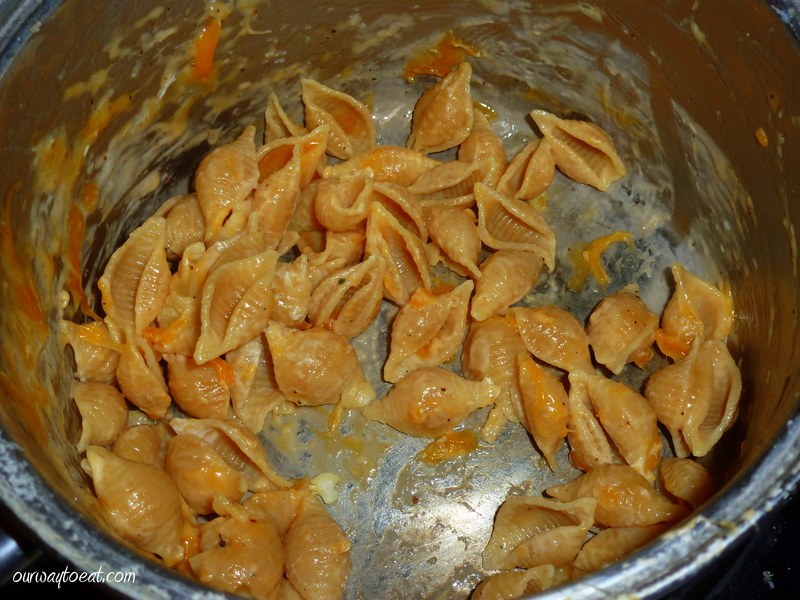 I also added a few handfuls of whole grain pasta shells to the saucepan of salted water to cook until al dente, according to the package directions. 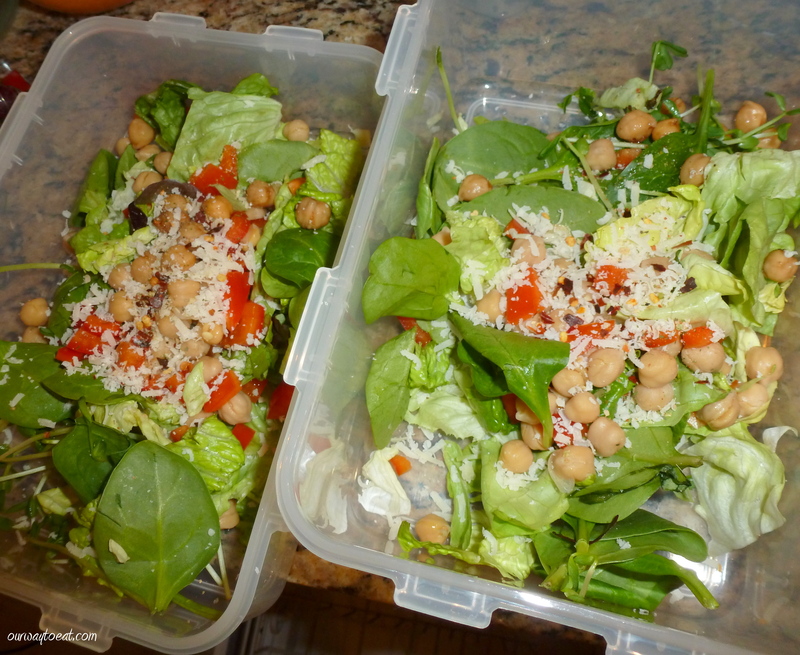 While the pasta cooked and the vegetables roasted, I began assembling the cold portions of the salad: two on plates for dinner tonight, and two in portable containers for our lunches tomorrow at work. I whisked a little balsamic vinegar with olive oil, and added a healthy pinch of red pepper flakes and a good shake of Trader Joe’s 21 Seasoning Salut to dress the salad. When the pasta was done cooking, I stirred in a spoonful of light cream cheese, a small handful of grated sharp cheddar, and a shake of nutmeg. I didn’t go to the effort of making a cheesy roux for the Mac & Cheese. I just tossed the cooked pasta with the cheese. The cheese melted and coated the noodles nicely. It was easier to make this way, and actually better to have the pasta coated in cheese, rather than a creamy sauce, since I was planning to toss it into the salad. 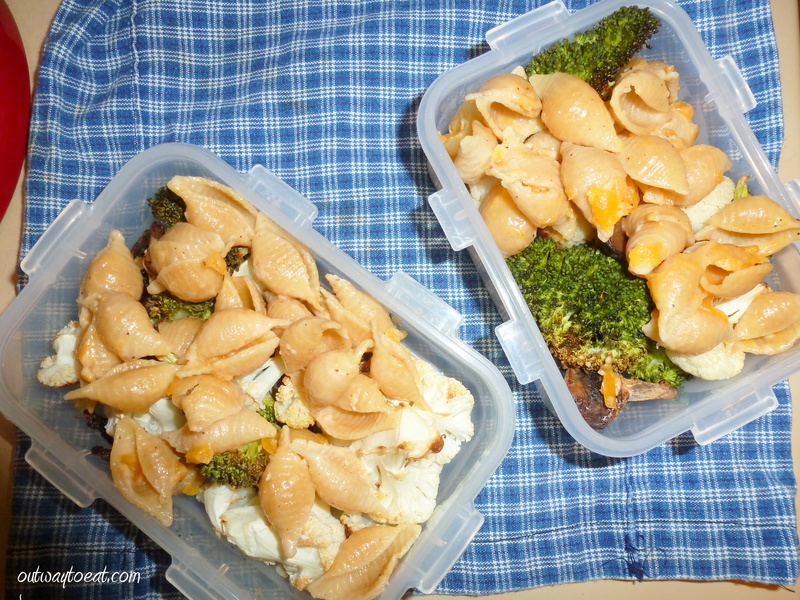 I divided the roasted vegetables between our plates and two small containers for our lunch. 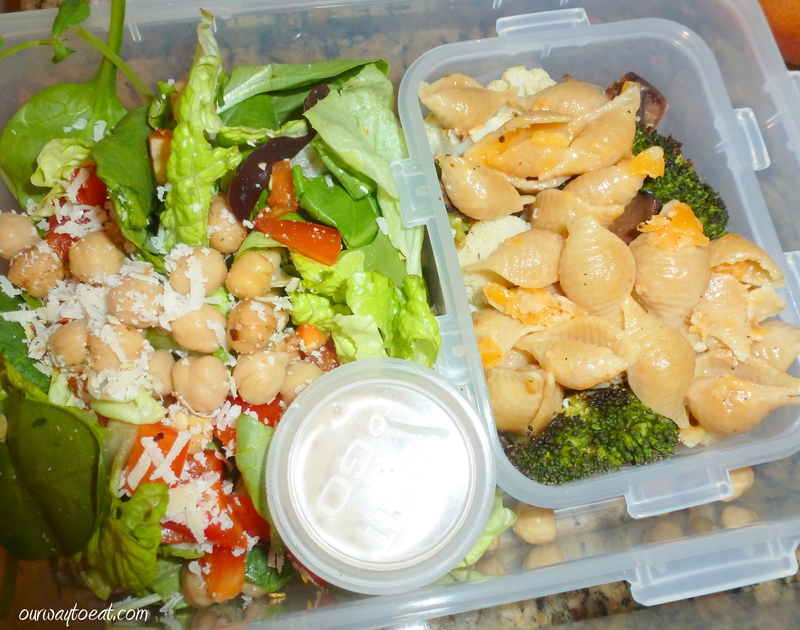 I dressed the two plates of salad for our supper lightly and tossed them before adding the mac and cheese, since I didn’t want too much dressing on the pasta part of the salad. If I hadn’t been saving half of the salad for our lunch, I would have tossed the hot and cold vegetables with dressing in a bowl before placing in it on our plates. I happened to use all of my homemade dressing up on our dinner portion, so I packed a small container of Trader Joe’s Light Champagne Vinaigrette* to take to work. I added a pinch of red pepper flakes and some grated Asiago so that the salads would still have a good flavor even without the balsamic vinaigrette that we had at supper. Once our plates were assembled, we charged to the dinner table and dug in. I put out a nice chunk of Asiago cheese and a grater, salt and pepper for us to adjust the flavor at the table. A Hot and Cold Mac and Cheese Salad might sound a bit of an off the wall, but it was great. The balsamic vinegar and spicy red pepper flakes were a punchy contrast to the warm, cheesy pasta. The variety of colours was visually appealing. 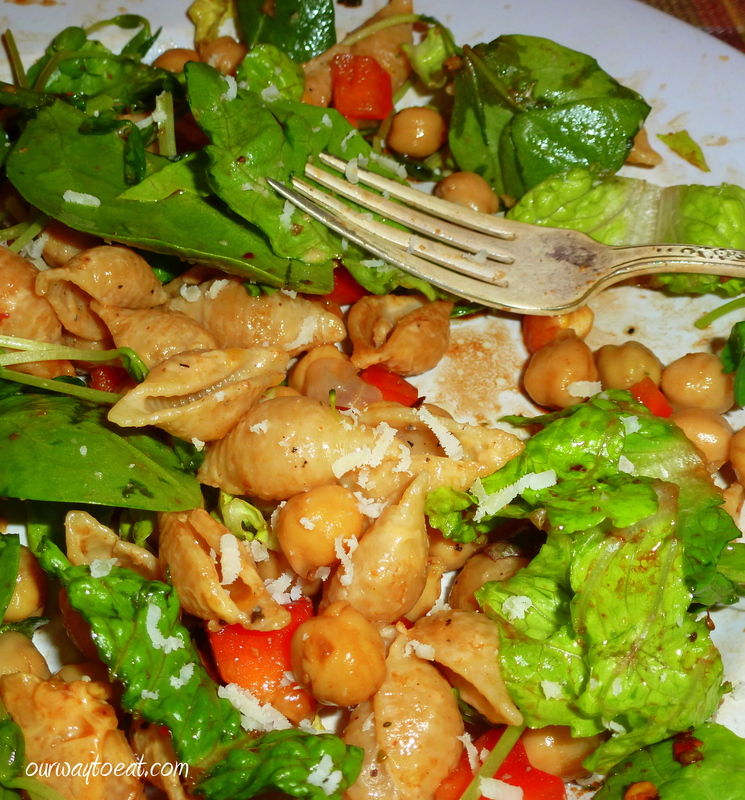 The crunchy lettuce and red pepper contrasted with the soft noodles and chickpeas. The roasted vegetables added warmth and charred flavor, and were roasted perfectly to retain their bite. Chopping, assembling, roasting, boiling, dressing and stirring together three different dishes raised a mild cacophony in the kitchen, that sung in harmony on the plate. I started with three ideas, and ended up with a meal that satisfied a hunger for Mac & Cheese, but kept the portion size reasonable, it was a plate packed with antioxidants and vitamins as well as great flavor and texture contrasts. We’ll make it again! *Trader Joe’s Light Champagne Vinaigrette is my current grocery store salad dressing favorite. It contains champagne vinegar, white wine, Worcestershire sauce, and Dijon mustard, and clocks in at 50 calories for two tablespoons. It is light and zingy, and it is a legit way to have some bubbly at noon. I’ve been thinking about snacks. If you say the word “snack” I associate it with the small plate containing Triscuit crackers with peanut butter and jam or slices of cheddar cheese that greeted me after school when I was a child. I recall the semester that I studied abroad in England the break between morning lectures was an occasion for friends meeting in a dorm room for cups of instant coffee and McVitie’s Biscuits. It also calls to mind taking part in the ritual of afternoon noshes — a tiny bowl of salty-crunchy bits and nuts served with a cocktail and a crossword at my great Aunt Margaret’s home Victoria, British Columbia — très sophistiqué. In these moments, snacking served a dual purpose — it was a time to pause and enjoy a simple and comforting luxury, and to stave off hunger for a few hours more until mealtime arrived. If you don’t happen to be in the midst of childhood or your college years, or making precious memories with elderly relatives, snacking can have a dark side. This would be most snacks that come in 100 calorie servings sealed in shiny wrapping, or anything mindlessly inhaled while standing fridge-side. I don’t find those snacks to be satisfying. For me, a snack composed according to a few simple principles fits into the romantic episodes in my life as well as the real world. 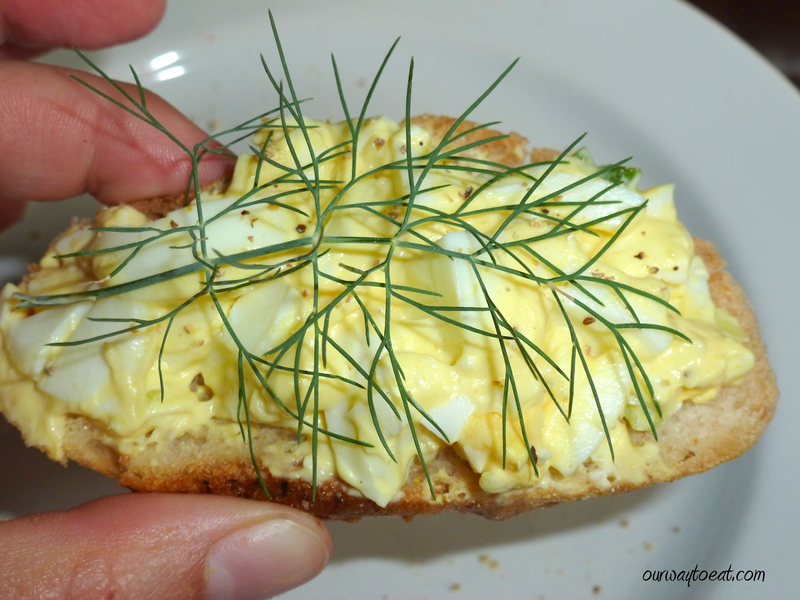 Take this tasty morsel — a tiny slice of rye bread topped with a little leftover egg salad and a sprig of fresh dill from my garden. It is well worth saving a few leftover spoonfuls of egg salad so I can have a snack like this one in the middle of a summer afternoon. The first principle of a good snack is that it should be quick. It should take less than 5 minutes, or preferably less than 3 minutes to prepare. I start each day with only so much energy to devote to food preparation, and I don’t want to devote very much of that to snacks. I like to keep a small bowl of hard-boiled eggs in the fridge so we can grab one for a snack at work. It only takes a moment to crack the shell and eat it with a little salt and pepper. 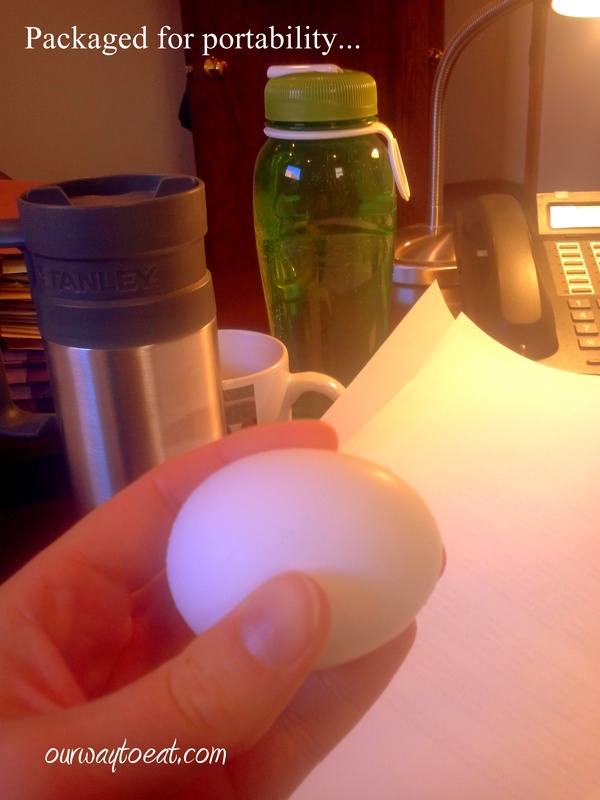 The protein and small amount of fat that an egg contains can sustain me through the afternoon. The second principle of a good snack is that it should either be light, or very very small. I usually opt for light. 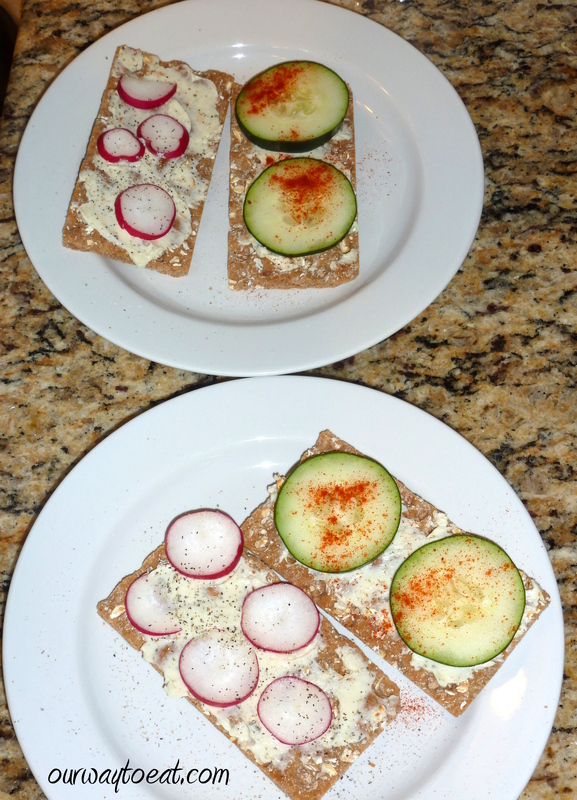 For this snack that I prepared for myself and for Bjorn, I spread a wedge of light Laughing Cow cheese on two Wasa Crispbread Crackers. I sliced a radish and some cucumber very thin. 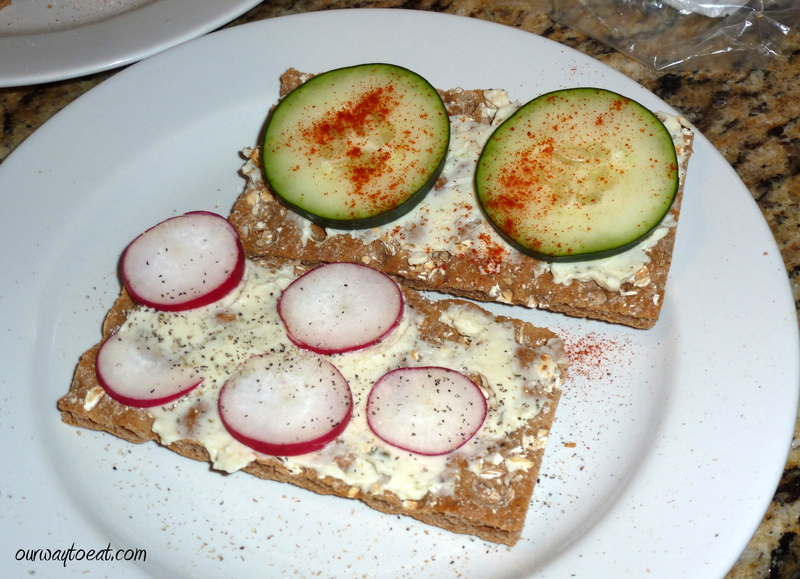 I sprinkled a little smoked paprika on the cucumber and a dash of salt and pepper on the radish. The whole snack contains less than 150 calories, and also healthy things like fiber. You can enjoy the crunch of the crackers and veggie slices, the creaminess of the cheese, and take in the brightly colored veggies with a punch of paprika with your nose and your eyes. The final principle of good snacking is to pause. While eating, it is so important to take a moment to pay attention, so you know you’ve eaten something, and to appreciate the nourishment. I also try to pause when I’m done. If it was a tasty snack, I might think that I want a little more, but if I give my mind and stomach ten minutes to catch up with each other, I usually find that I’m satisfied. It is a good indication that we are getting pretty low on groceries and fresh produce when I decide what is for dinner by googling the few ingredients we have left to find an idea. Tonight, I poked around the kitchen and found a can of white beans, a potato, and a half a bag of frozen corn to work with. Those three ingredients sounded like a good base for a soup. I wasn’t feeling like a chunky Tuscan White Bean Stew, or a creamy Rosemary White Bean Soup even though they looked tasty. We didn’t have half the ingredients for this luscious looking Corn Chowder with Chilies by Pioneer Woman and we wanted something lighter. As far as I can remember, I don’t think I’ve ever combined white beans, corn and potato in one pot, but it seemed like these 3 pale, starchy comforters had to go together. 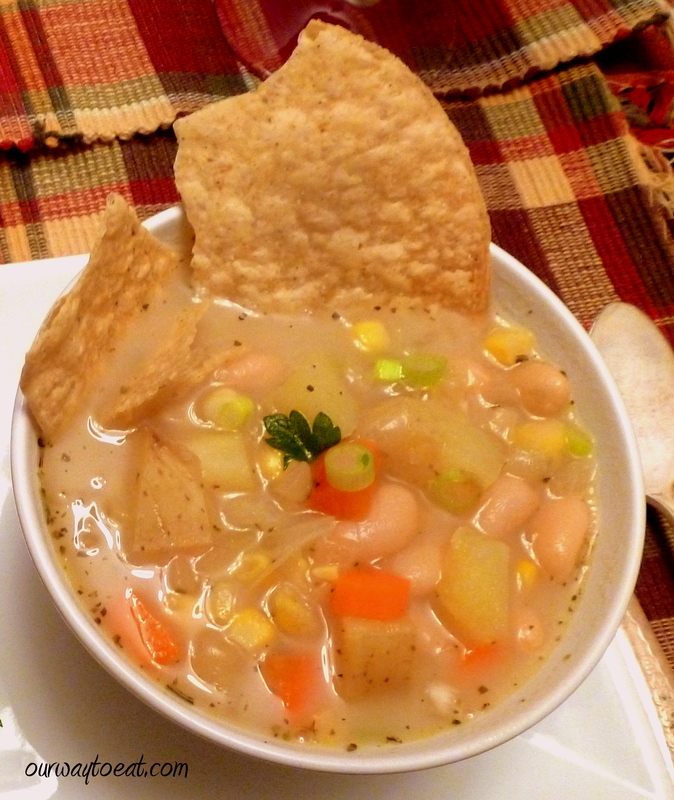 I thought “there must be a recipe for this white bean, corn and potato chowder!” I immediately found two, fairly similar recipes that sounded tasty, [here and here]. 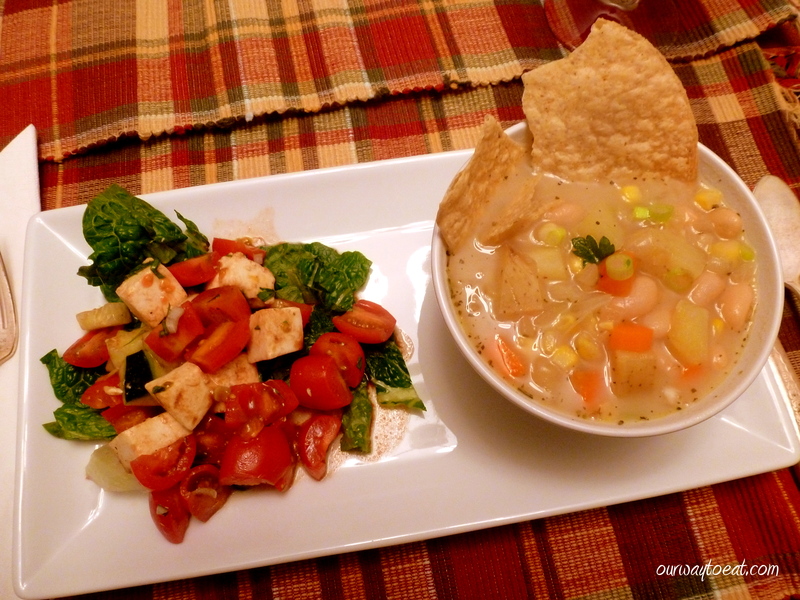 I took cues from both recipes, made a few adjustments of my own and ended up with a soup that was healthy and warming that we both enjoyed. First, I assembled my ingredients. One cup of Frozen Corn. 1 16 ounce can of Cannellini Beans. — I happened to have a large can of beans so I used it, but you’d be fine with a 14 ounce can. If you are up for preparing dry beans, which sadly, I am not, you should use about 1 cup of dry beans, soaked and cooked in water until tender. 1 Yukon Gold Potato washed and chopped. 1/2 of a yellow onion, diced. 1 carrot, peeled and diced — I ended up using only one carrot, even though my photo contains two. 1 stalk of celery, chopped. –I didn’t have any celery, but normally, I would include it. 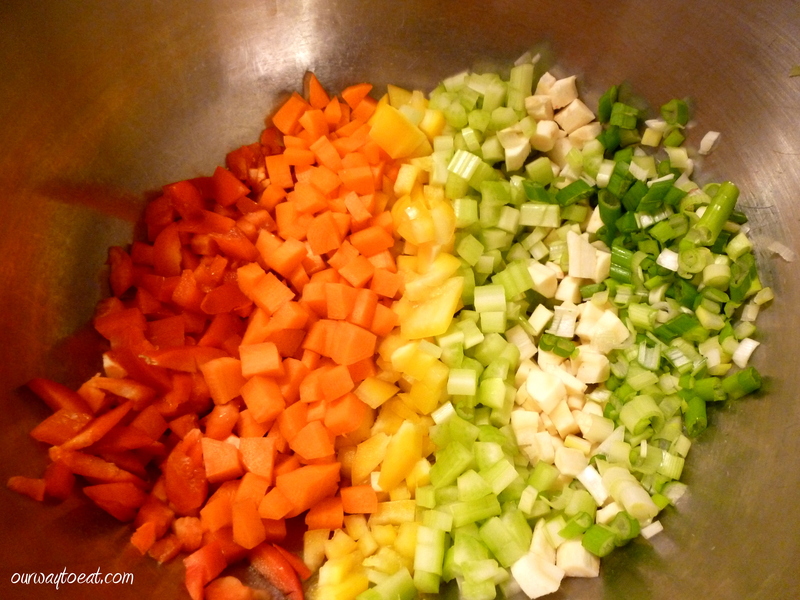 Diced Onions, Carrots and Celery, or a mirepoix if you are cooking in French, makes a solid aromatic base for almost any soup or sauce. 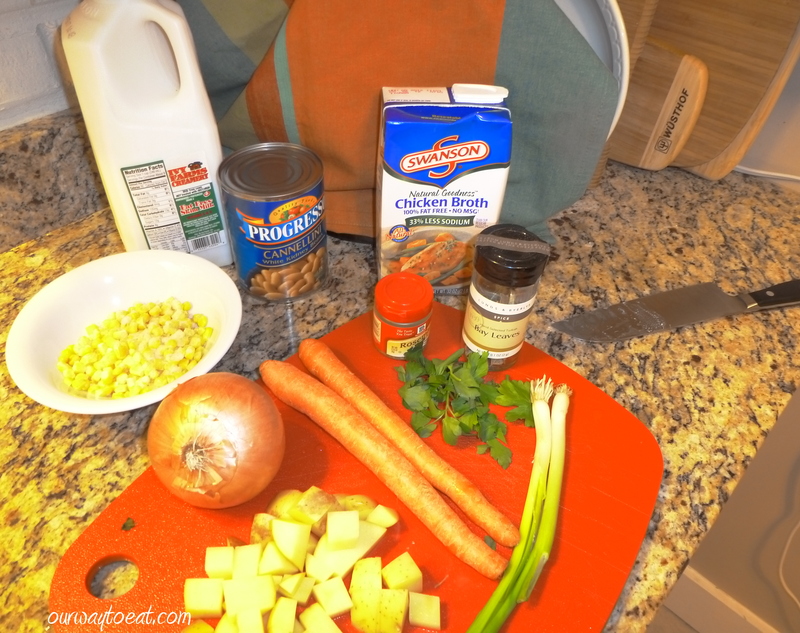 1 four cup carton of Reduced Sodium Chicken Broth or Vegetable Broth. For Garnish: 1 thinly sliced green onion and coarsely chopped flat leaf Italian parsley are both optional, but good. About 1/2 a teaspoon each of crushed dried Rosemary, and dry Thyme. A splash of skim milk, or half and half, or heavy cream, depending what fits into your diet. 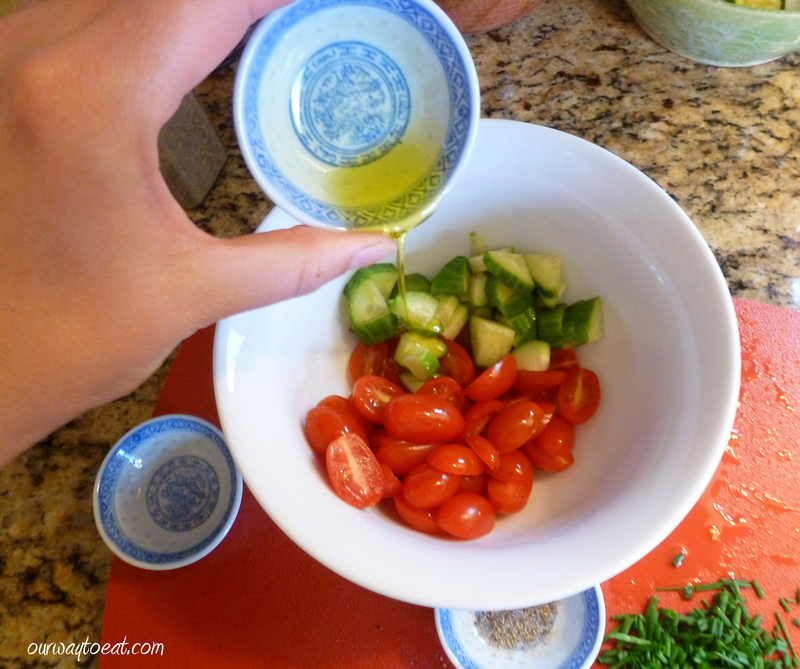 A small amount of Olive Oil for sautéing the veggies. We have 2 people eating in our house most nights, so I try to cut soup recipes down to 4 portions, so that we each get to have a hearty bowl for supper and a smaller bowl for lunch the next day. It took me two years to figure out that I need to cut down most recipes. Having a few frozen portions is great for lunches at work or an easy supper, but a freezer can fill up fast in the winter when I feel like making a new pot of soup a few times per week. If you have a bigger head count, or feel like stockpiling soup for lunches and lazy days, you can easily double or triple this recipe. Once I had all of the veggies for the chowder chopped, I began by sautéing the onion and carrots. 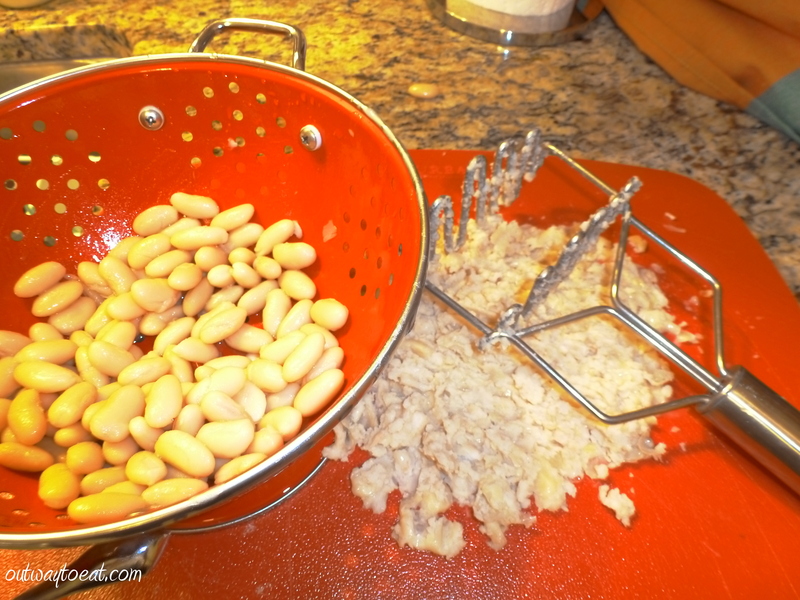 I rinsed the cannellini beans, and mashed about half of them on a cutting board with a potato masher. I did this for several reasons. Since I wanted the chowder to be light and healthy I decided not to use half and half or cream in my chowder which are traditional chowder ingredients. Mashed white beans added velvety texture to the soup liquid that it would otherwise lack without cream. I used a potato masher because I don’t have an immersion blender* and lugging out the blender or food processor to puree half of the soup is far too much effort for me on a Tuesday night. The potato masher works quite well to create a rustic creaminess and it cuts down on dish washing which is also a plus. When the carrots and onions began to get soft in my enamel dutch oven, I added the rest of the ingredients except the milk and garnishes. I let the soup simmer for a good half hour to 40 minutes. This gave me time to set the table, check Facebook and chop up some grape tomatoes, fresh mozzarella and leaves of romaine lettuce for a small salad, along the lines of a caprese, minus basil. 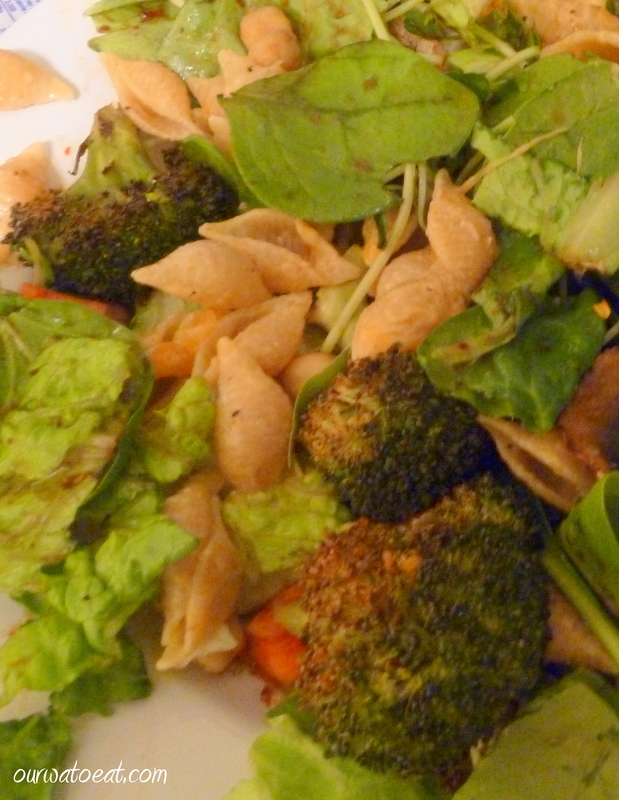 I dressed the salad with balsamic vinegar, salt and pepper and Trader Joe’s 21 Seasoning Salut herb mixture. Once the chowder was hot and all the flavors combined, I removed the pot from the heat. I mashed the entire mixture of veggies little a more with the potato masher right in the soup pot to allow the carrots, corn and potatoes to add body to the liquid in the chowder. Right before serving the chowder I stirred in a splash of milk. I served the chowder in a small bowl with the salad on the side of the plate. On top of Bjorn’s salad I added a few this slices of Sopprasetta, a dried, cured Italian salami. We loved this chowder. It was warm and satisfying, but still light and healthy. It will reheat well for our lunch, and we will able to eat the whole pot in two meals. This meal made good use of the last few vegetables in the house. Even if my fridge is fully stocked, I’d make it again. * An immersion blender might be a good gift idea, hint, hint. 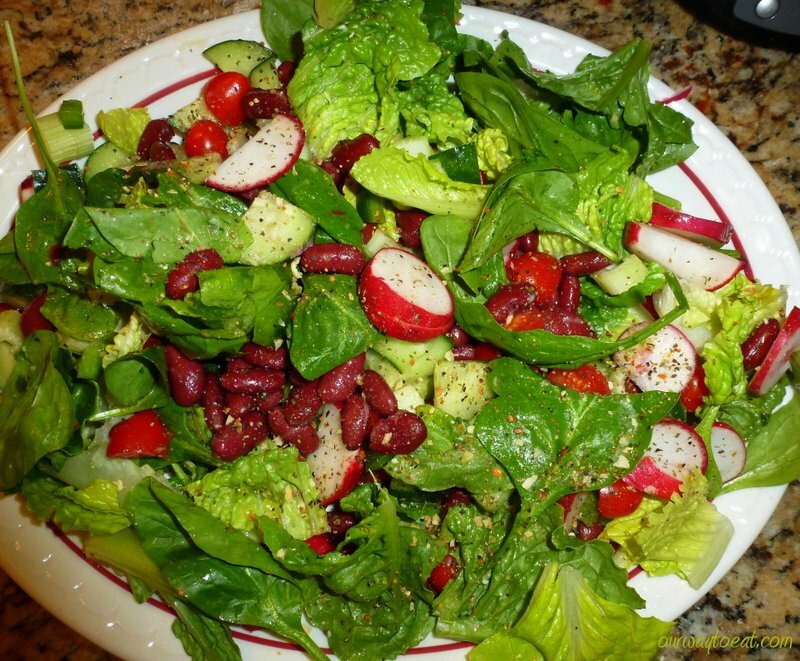 Some days there is nothing more refreshing and satisfying than having a hearty salad as a meal. A salad can be extremely handy too, when it is built to last so that it can reappear the next day as our lunch. That is the sort of meal I had in mind today. The salad I made was loosely based on a recipe for a Wheatberry Salad that I read about on Macheesmo, a blog I like to visit. I’ve been trying to follow more recipes because I want well-developed flavors and predictable results when I cook. Even though I’m trying to follow recipes, I still have to strike a balance. I am not one to plan meals in advance, and I don’t like to run to the store when I decide to make something. I began by gathering ingredients. 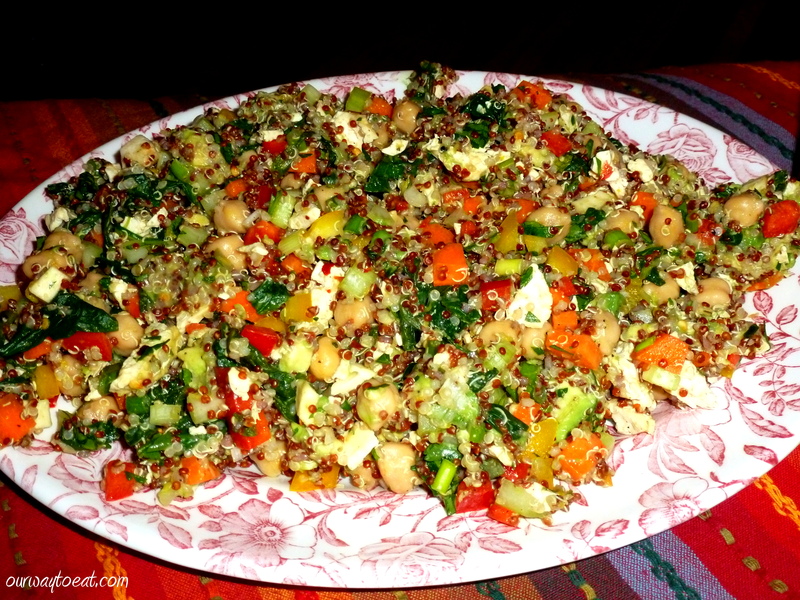 In my salad, I subbed Quinoa for Wheatberry. I’ve glanced at a bag of Wheatberry in the grocery store, but haven’t purchased that grain so far. I am still working on integrating Quinoa into my regular cooking routine. I also subbed fresh spinach for kale, and half a block of drained and crumbled tofu for feta cheese. We’ve been working our way through a bag of organic parsnips from the Farmer’s Market that we bought at Thanksgiving, so I decided to add a few. I started cooking 1 1/2 cup of quinoa in an equal amount of water, and while the quinoa cooked, I chopped the vegetables into small, uniform chunks. They say you eat with your eyes first; the vibrant rainbow of crunchy vegetables chopped for this salad was a visual feast. 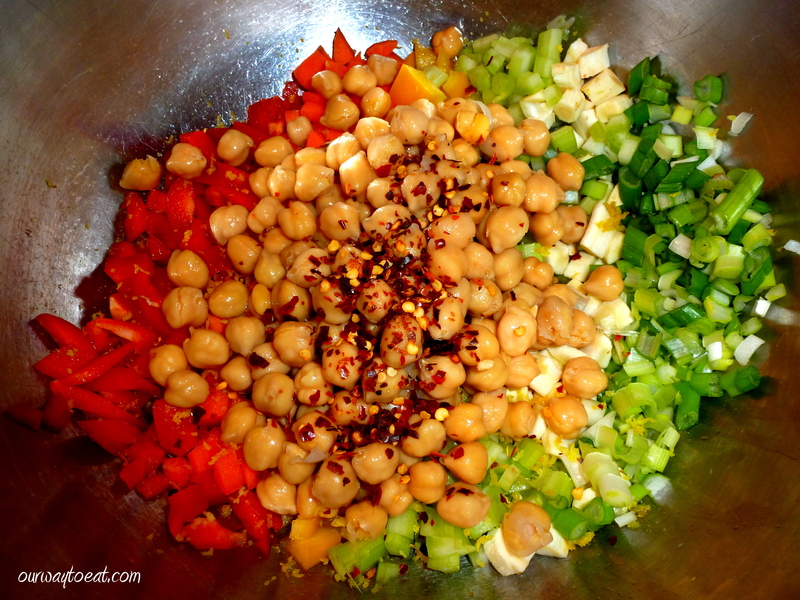 The salad is dressed with the juice of a lemon, the lemon’s zest, red pepper flakes, salt and pepper. It gives the salad a lot of kick with zero added fat. Healthy!! The lemon juice has the added benefit of keeping the avocado from turning brown. If I make this again, I will cut back on the lemon zest a little bit. The zest of a lemon is pretty punchy, especially when you eliminate a creamy dairy component which was included in the original recipe. Did we notice the substitutions I made to the original recipe? A little. Crumbled tofu has a similar texture to feta cheese, but it lacks the tang. There is also a certain creaminess that feta would add, which would also probably help balance the pungent citrus in the salad. Neither of us are huge fans of feta, and so it was a fair swap to make, and healthy too. I am all for subbing spinach for the kale called for in the original recipe. I have yet to delve into kale, and I love how easy it is to add a big bunch of fresh spinach to almost anything you are cooking and allow it to steam in just a few minutes. 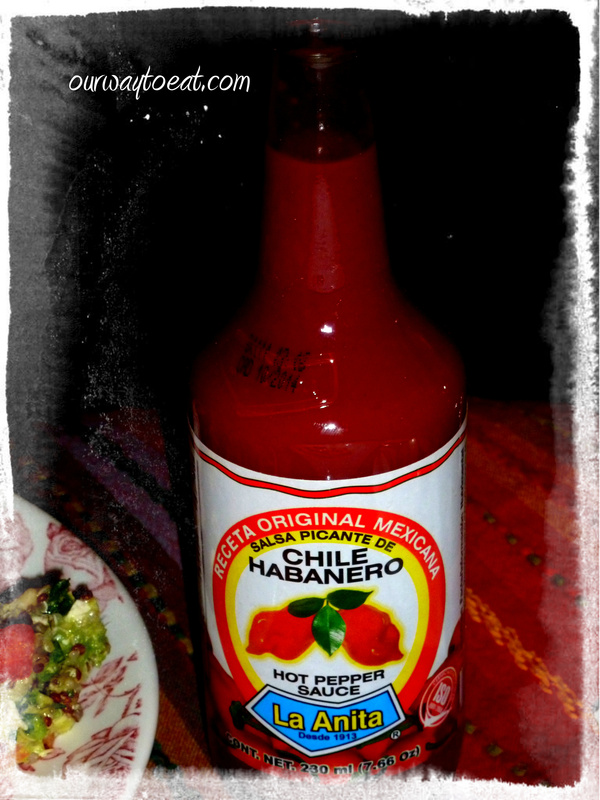 We both enjoyed the salad with a dash of Habenero Chili hot sauce that we brought back from Mexico. This salad was a success for several reasons. It contained an antioxidant rainbow of healthy vegetables. It also contained the healthy fat found in avocado. 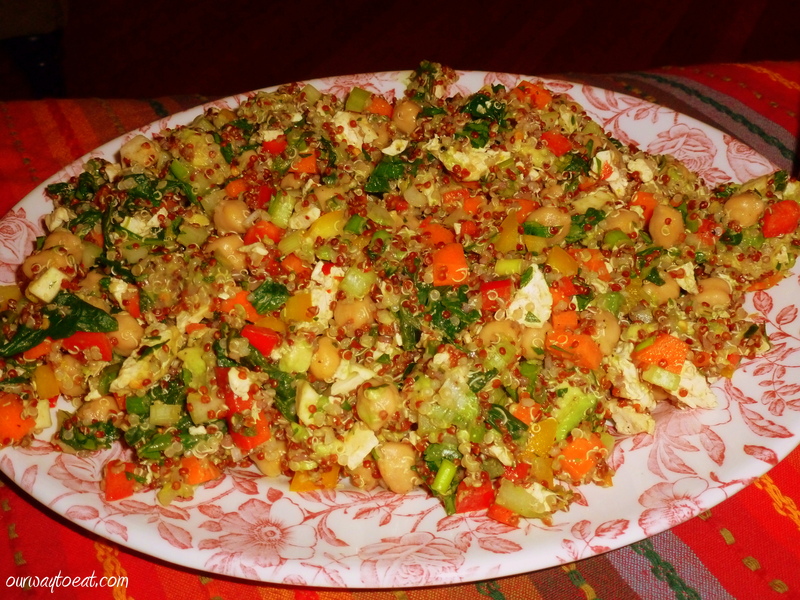 The texture was the best part of the salad; it had crunchy carrots, celery, onions, parsnips, peppers which balanced well with the creamy avocado, supple quinoa, tofu and tender steamed spinach. There was plenty of kicky flavour without any regret with the spicy-citrus dressing. It was also a win from a vegetarian-protein perspective since it contained both tofu and chickpeas. All in all, it was a light, uplifting, healthy and hearty entrée salad that hit all of the important notes that it needed to pick us up on a grey day in January. Yes!! Bjorn said the salad was tastier than he expected, and we both ate it again the next day. For me, it was both breakfast and lunch. 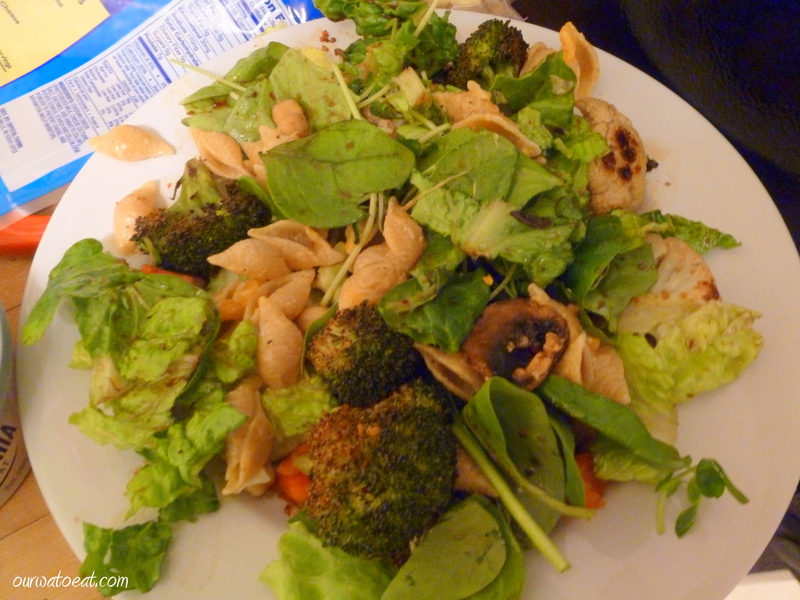 I need to make a crunchy, kicky, creamy, low-fat, high flavor, protein-rich salad more often. One of my favorite films with a memorable food-moment is Amélie, a simple and joyful French film from 2001. [Spoiler alert…] Amélie is a solitary character with a wonderful internal life. She observes the world exactingly. She appreciates simple pleasures and amusing oddities in the goings-on around her with her eyes open, and her mouth closed. Amélie finds joy in her private life, but also experiences a lack human closeness. Throughout the movie she launches a series of secret undertakings that bring beauty, life, love and joy to her father, her neighbours, her co-workers and the man who helps her at the vegetable stand. Her mischievous initiatives become a catalyst for change, new possibilities and happiness. Waging her secret campaigns for improvement in the lives of others brings Amélie vicarious joy, but she experiences isolation on her own. One evening, Amélie stands in the kitchen of her darling little apartment, making herself a bowl of noodles, clearly on auto-pilot. She drains the pot of pasta, and uses a rotary grater to top the noodles with cheese, all the while staring in apparent contemplation of the state of her life. The quiet evening in her safe haven ends in lonely and frustrated tears at the realization that she is living outside, without meaningful connections of her own. I love so many things about this film, and I watch it now and then and discover more that I enjoy. What I have enjoyed since the first viewing is that simple bowl of noodles. You can do so many things with food, and especially pasta, but so often, the simplest are the most perfect and enjoyable. 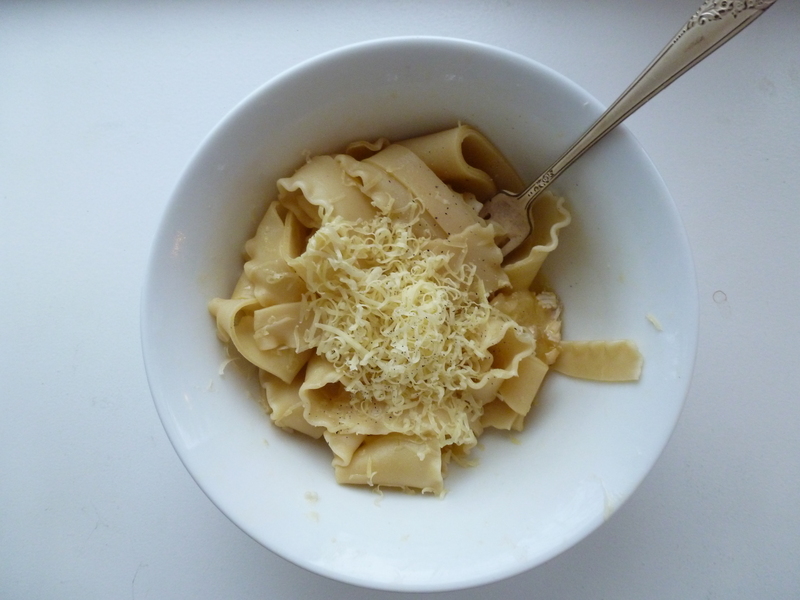 Boiled noodles, a little butter, salt, pepper and sometimes, some grated cheese served as simply as possible is a plate of food that manages to nudge on sublime. Here is my most recent bowl of buttered noodles with cheese. We had only lasagna noodles in the cupboard, so I boiled them in an ample amount of water, lightly salted. Once they were cooked al dente, I drained them and used a pizza cutter to slice the broad noodles to an imperfect approximation of papardelle. I thank Martha Stewart for including broken and jagged shards of lasagna noodles in a pasta recipe in the cookbook Dinner at Home for inspiring the use of spare and broken lasagna noodles in a non-lasagna dish. I stirred a little butter thinned with a splash of warmed vegetable stock to allow the noodles a thin coating. I topped the bowl with finely grated white cheddar, ground pepper and a tiny shake of salt. It was delicious. No further elaboration is required. As for Amélie, she finally succeeds at taking the joyful leap into living her life when she removes a literal and figurative mask of protection and reveals her identify to a man whom she secretly admires. In opening herself up to the possibility of success or failure at love, a life that Amélie has previously observed as an outsider begins to unfold. Our moments of real pleasure in this life are so precious-they are best enjoyed through attention and fully and openly savoring every delicious experience, no matter how simple. I will admit it. Sometimes we go out for dinner. I wish I could say it was planned in advance and anticipated. In reality, it is most frequently a decision made last-minute when we have been busy and we’re too tired to cook. We are fortunate to live near quite a few great restaurants. Going out to dinner is a common happening when we’ve been doing a ton of entertaining and the associated cooking and cleaning and don’t want to mess up the kitchen and have to clean it again. In November, we had a Chili and Chocolate party for 16 friends and out-of-town guests at the beginning of the month, prepared and delivered a few meals to an emergency youth safe-house in our neighbourhood, and hosted Thanksgiving for us and our parents. Each of these meals required planning, shopping, food preparation and cleanup, and left us a little zonked the day before and the day after. There will be a series of posts on our November food preparation, but in the meantime, I’ll share a glimpse of a typical meal we ate this month on a busy week night evening. I’ve been strongly favoring restaurants that make it easy for me to make a healthy food choice and eat a smaller portion. That is why we’ve eaten at the Birchwood Cafe three times this month(!) Their menu is full of vegetarian-friendly, healthy choices, imaginative combinations of ingredients, and most importantly, the food tastes great! Of the three Birchwood meals I’ve had this month, I’ve eaten the Roasted Three Seed Sandwich twice. I’m hooked. The sandwich is served on focaccia which is much more appetizing than it appears in the photo above, where the herbed bread looks like a drying out slice of a puffy omelet. The sandwich’s handle makes reference to a crunchy spread made of pumpkin, sunflower and sesame seeds which is very good. What really makes the sandwich a hit for me is the combination pumpkin-curry spread, microgreens and very thin, crunchy slices (more like shavings) of black radish, carrot and chioggia beet. It is an inspiring sandwich. I’ve made several sandwiches at home with thinly shaved root veggies since; and I am so glad to have been given the inspiration to include these vegetables in a sandwich. They add a different textures and flavor and they are capable of so much more than simply being roasted or served in a cold salad. 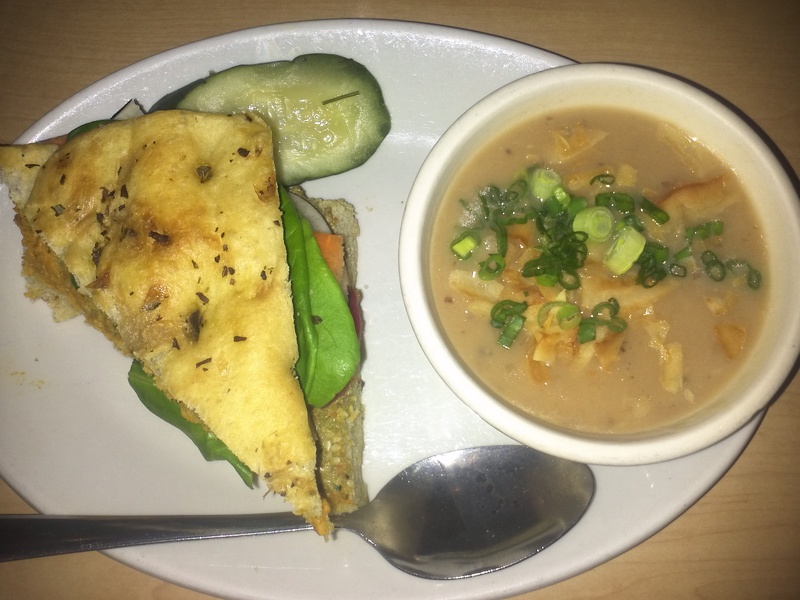 On this particular evening, I had a half sandwich with a pretty average cup of roasted root vegetable and potato soup. It was a thin, and sort of nondescript soup. 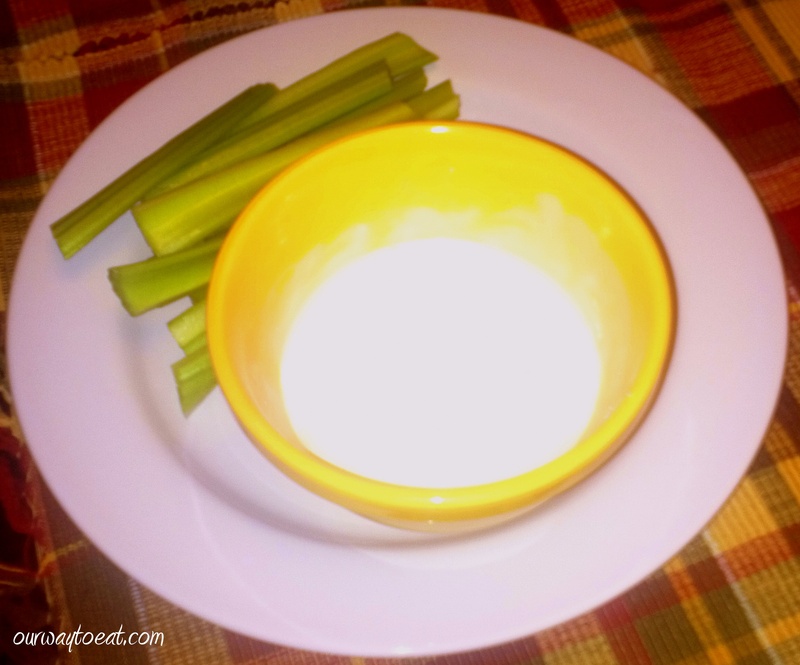 The crunchy somethings, and the fresh scallions on top were the flavor and texture highlight. The soup really wasn’t much. The thick slice of cucumber that my sandwich was served with is slightly softened and briny with vinegar and dill, but I wouldn’t say that it has crossed over into being a dill pickle just yet. I tasted Bjorn’s soup, and it was definitely the better soup choice of the night. He had the chipotle red pepper bisque with white rice. I am not sure, but I think the soup is topped with avocado oil. I didn’t order it because we eat store-bought roasted red pepper and tomato soup fairly often, and I thought I should try something else, but this was darned good. Much more flavorful than the lame, boxed Roasted Red Pepper soup we have at home, as well as the Roasted Root Vegetable watery affair that I ordered. Bjorn’s sandwich was also decent, according to his report. It was an 0range-braised pork shoulder shredded with fontina, roasted pear puree, sweet onion and lettuce on a sesame seed buttermilk bun. As you can see in the picture, Bjorn removed most of the onions. 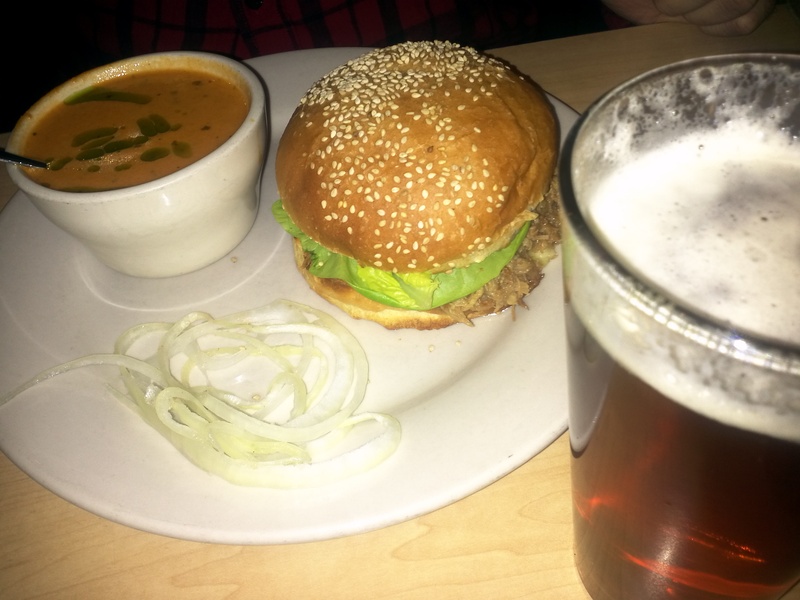 We both enjoyed a pint of Westside by Harriet Brewing, a copper-coloured slightly-hoppy, and somewhat tart ale. Even though tonight we did not dine in the same room as Haley Bonar or Mason Jennings as we have in other trips to the Birchwood, we really enjoyed our meal and I’m sure that if December is anything like November, we’ll be back soon. We sit down for a hot breakfast at home most weekends once, if not twice. Sitting down to eat something hot rather than scarfing down a granola bar or toast on the run between our house and our desks starts a weekend morning out right. Since it is so easy to make a good breakfast at home, we find we enjoy it more than going out and spending an hour and $15 for a breakfast in a crowded diner. Sometimes we make an elaborate meal. Huevos Rancheros, Breakfast Pizza, French toast, Belgian Waffles, Scrambled Eggs with Sautéed vegetables and cheese, bacon or sausage, veggie bacon or sausage, coffee, juice and fruit all show up upon occasion. But there are also days when the preparation takes only minutes. When it is Saturday, and you are eating breakfast at home, both of these breakfasts are very enjoyable, depending on the day. 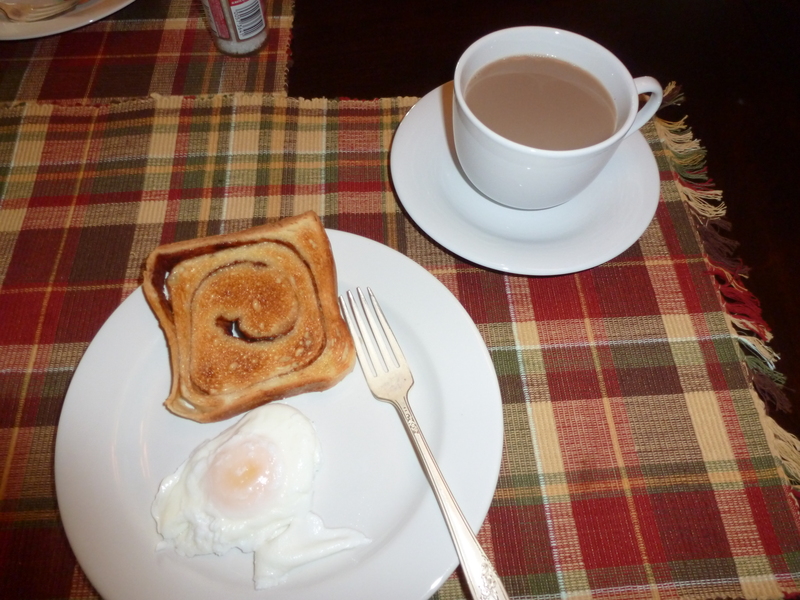 Today we wanted to get going on our day so our Saturday breakfast needed to be quick, so I decided to keep it simple with poached eggs and toast. We had a little cinnamon swirl bread leftover that we purchased for an elaborate French Toast affair. I toasted two thick slices, and brought a shallow pan of water to a simmer on the stove. I added a tablespoon of white vinegar to the water to help keep the egg together. I simmered the eggs for a few minutes until they yolks were beginning to get firm. We ate the toast with butter. I added a touch of fat-free chocolate milk to my cup of coffee to make a quick “at home Mocha”. A poached egg needs only to drain well, and be served with a little cracked pepper and salt. This breakfast is as quick and simple as it gets. It was satisfying without weighing us down, which is a great way to start a Saturday.